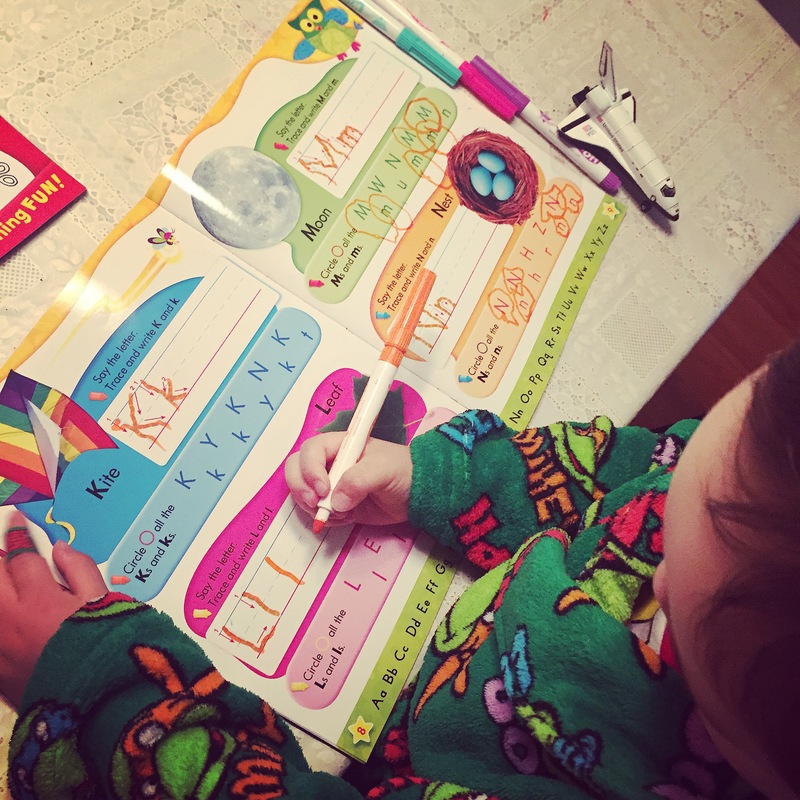 Blogging the ups and downs of parenthood and all the little bits of creative moments we have inbetween. It’s been so difficult lately with the kids not sleeping as well at night. It might be something to do with the warmer nights. Whatever it is, it’s taking it’s toll on me! EXHAUSTION! Even after a quick shut-eye during their naps aren’t cutting it. Migraines!! 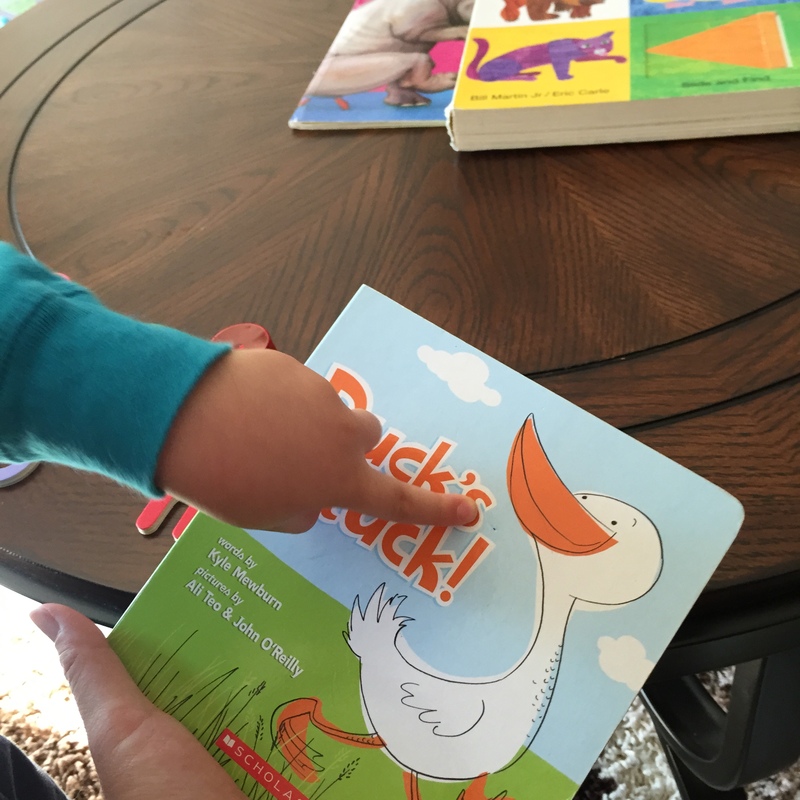 Ahhhhh…..hence the lack of blogging lately. 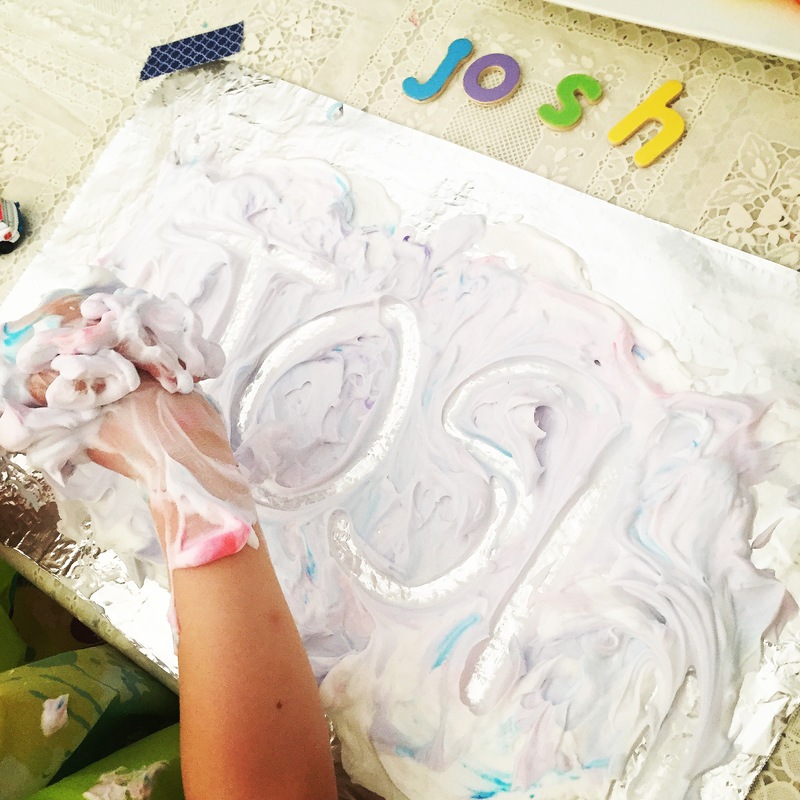 However, I’ve been dying to share more of our letters and numbers activities!! 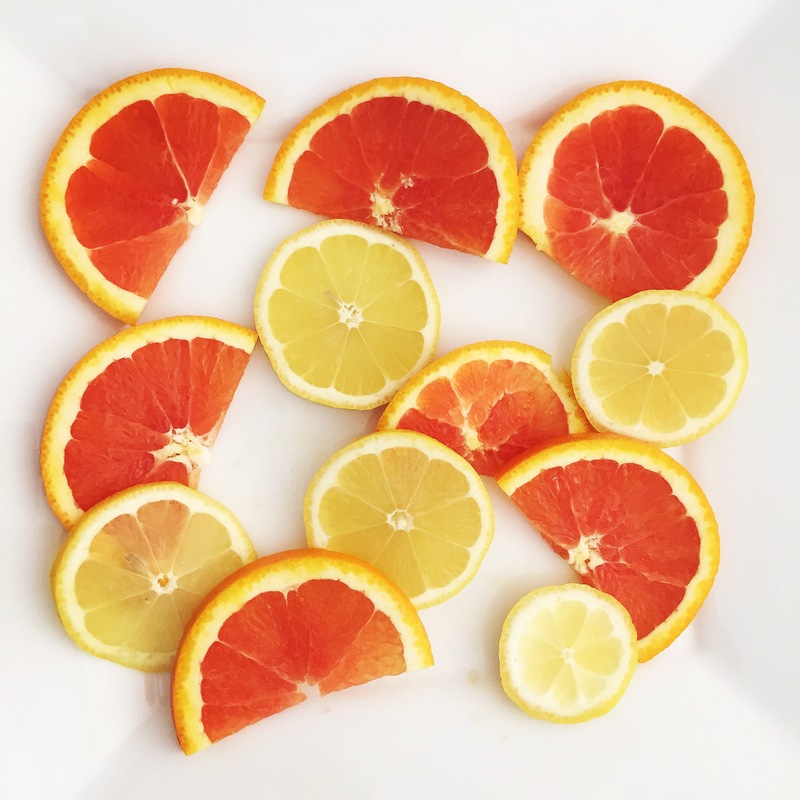 Back when I was studying for the SATs (gosh that was centuries ago), I remember reading about how citrus scents can improve cognitive function like visual-motor responses, provide alertness, and assist in memory recall! I have to admit, if I smell a certain brand of perfume, it’d remind me of my days at the university because it was the brand my professor wore. Similarly, when I was living in Australia, if I smelled pine, I’d get homesick as it reminded me of the pine trees in America. How about a special dish that only your mom used to make? 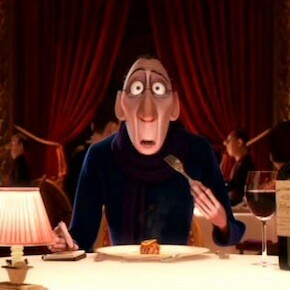 Anton Ego from Ratatouille anyone? 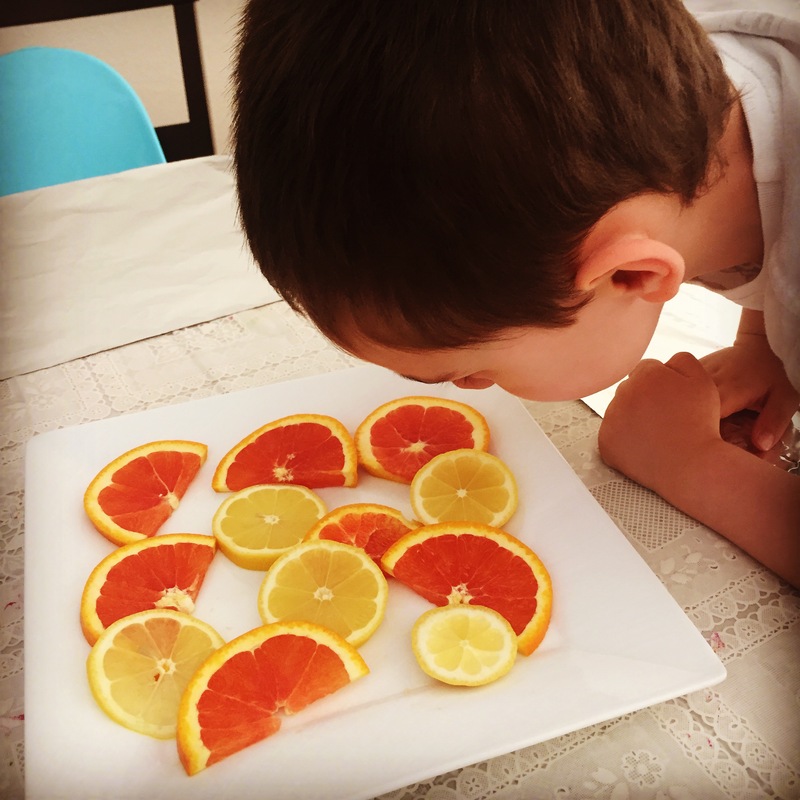 Today, I cut up some ripe oranges and fresh lemons for the kids to smell, touch, and taste while we did our name recognition activity. I had them smell and taste some slices. 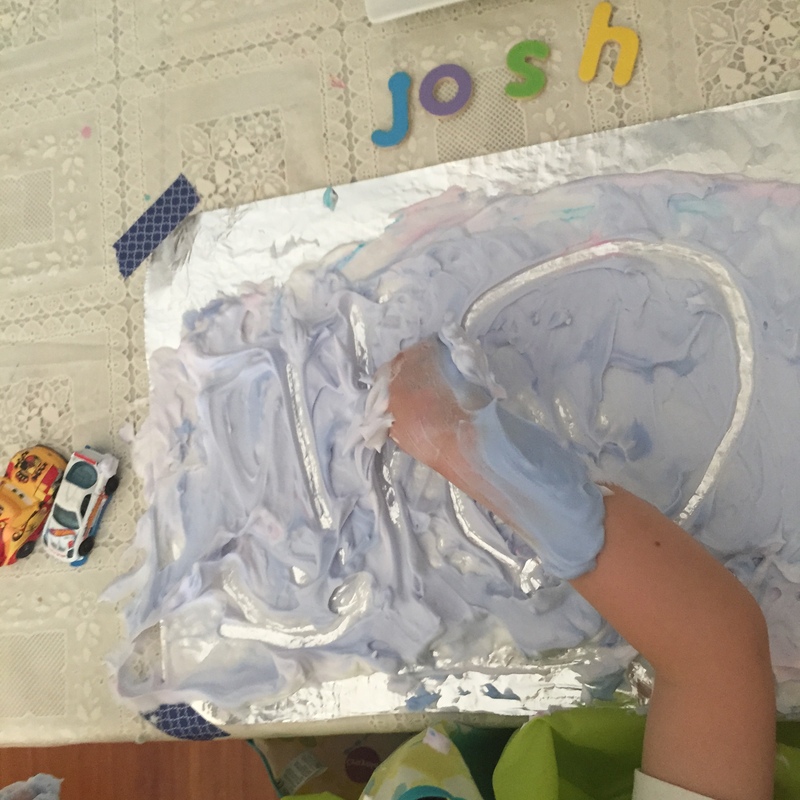 Then placed sheets of foil in front of them to write their names on shaving cream. 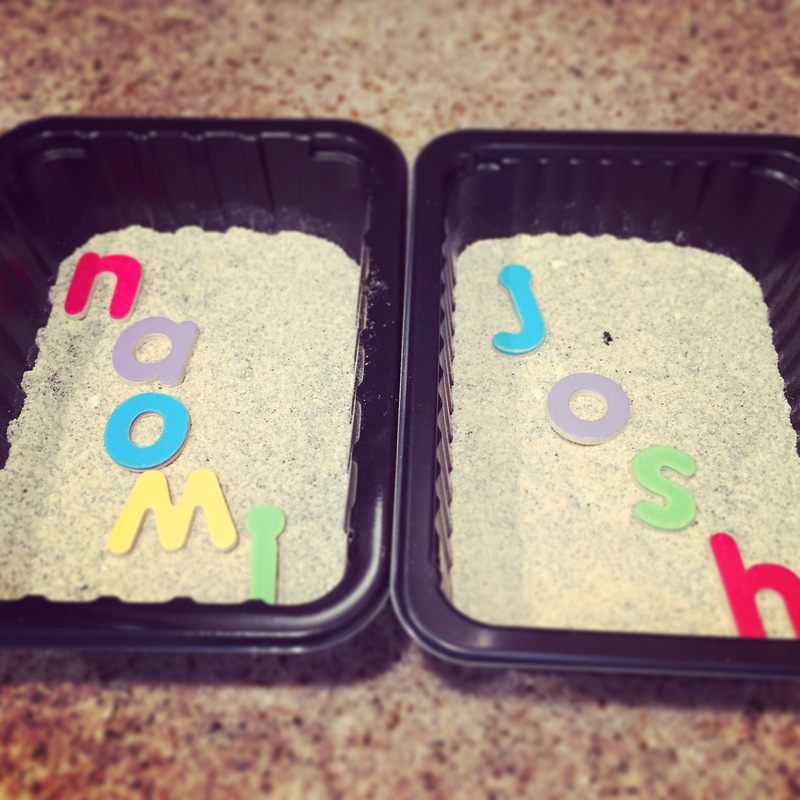 I’ve also presented their names with wooden letters so they can see how it should be spelled. 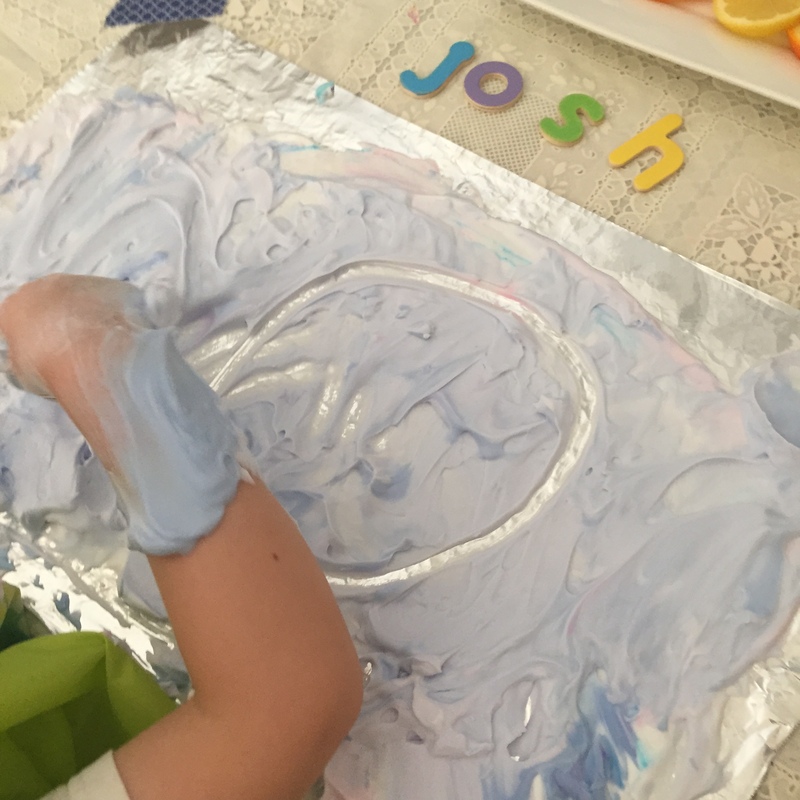 To help him remember “J,” I told him to remember that it’s the letter that looks like a hook. For “H,” I told him it looks like a little bridge. Seems to work! 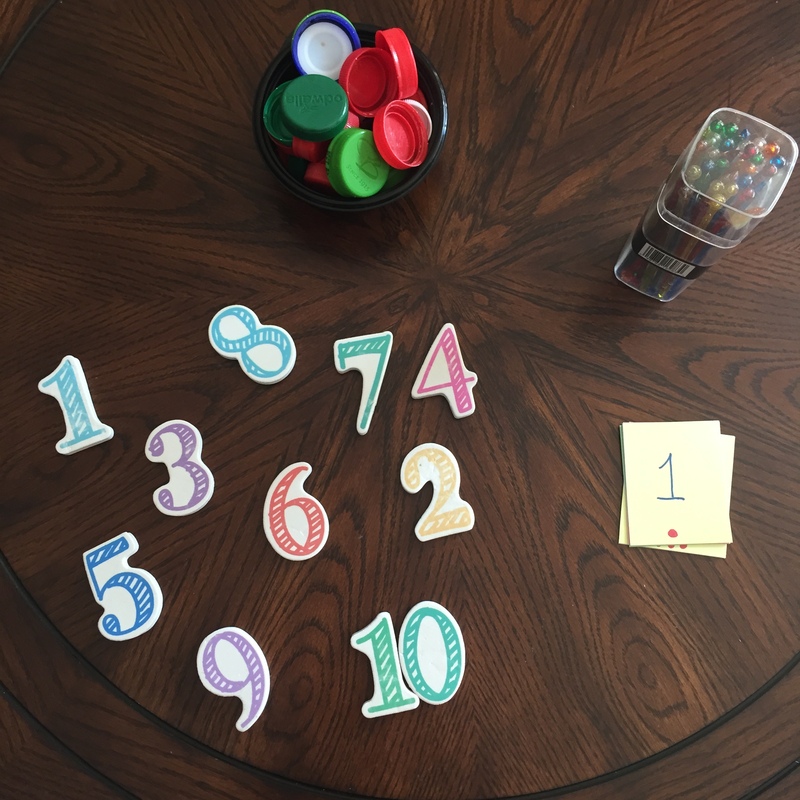 First, I laid out the cards from 1 – 10 and asked J to match the foam numbers to the cards. 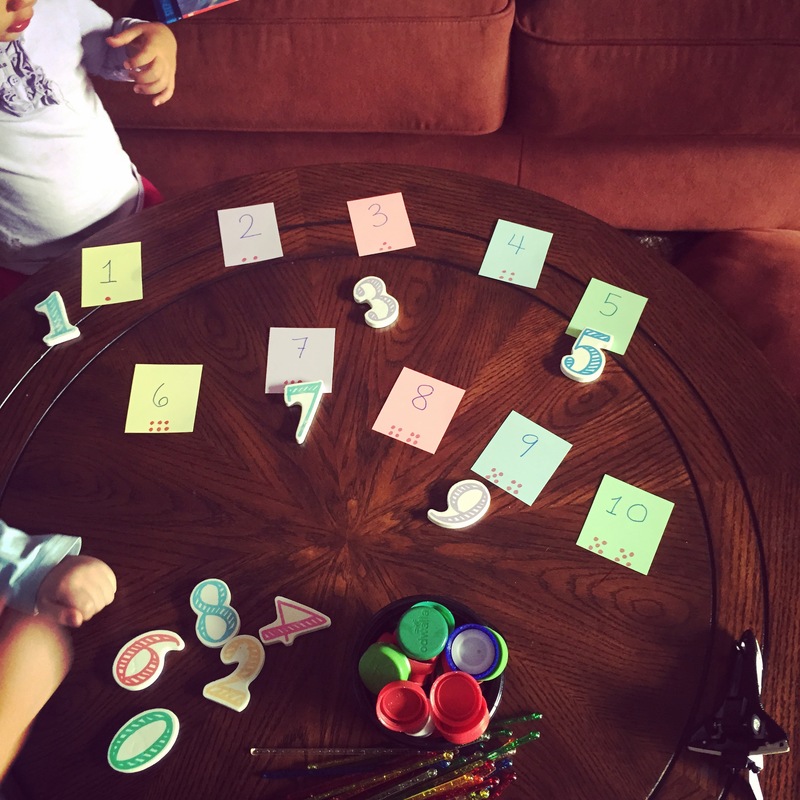 We read each number out loud. 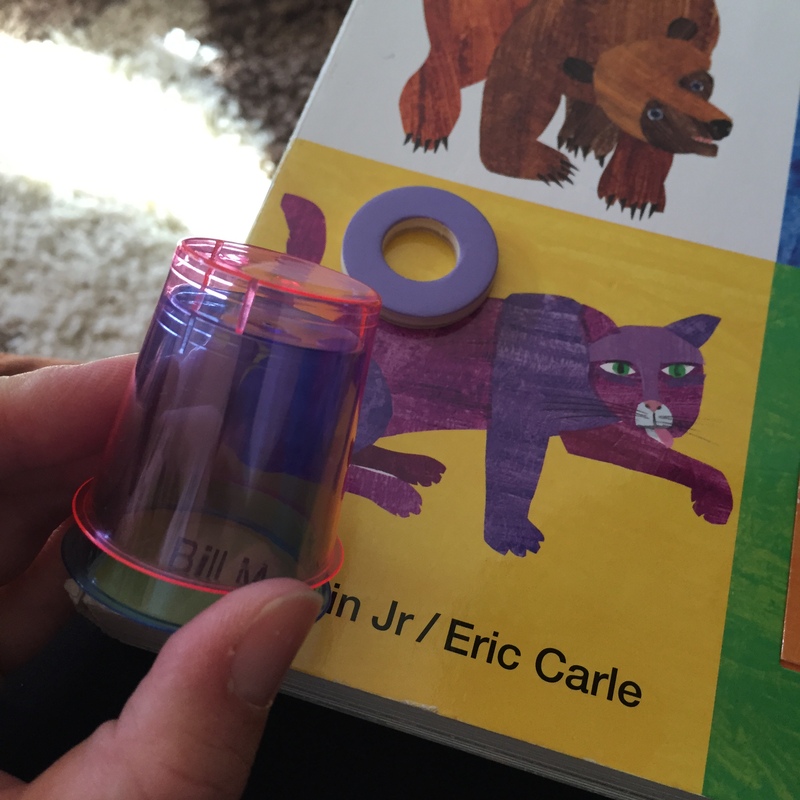 Then we sorted the bottle caps by color and counted how many there were. 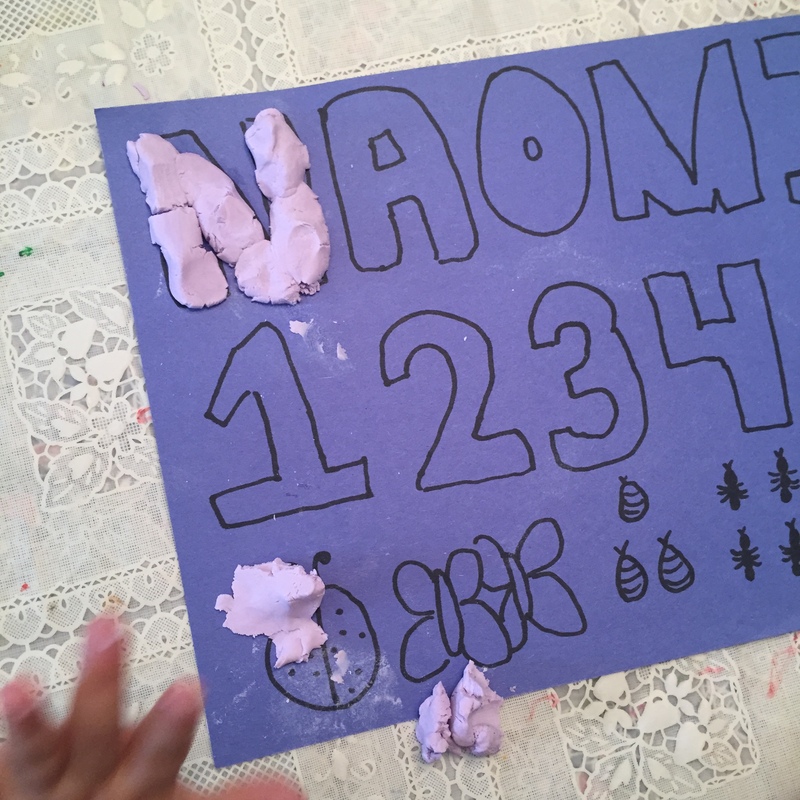 We found the matching index card and foam numbers. 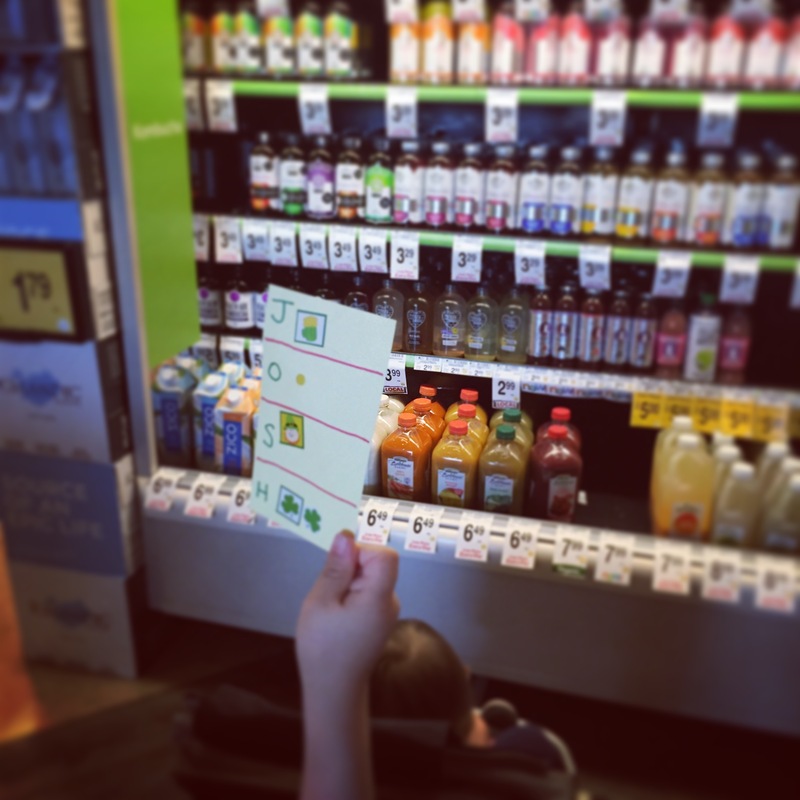 If J got stuck, I’d remind him to count the number of dots on the index card and match the bottle caps to the way the dots are drawn on the cards. 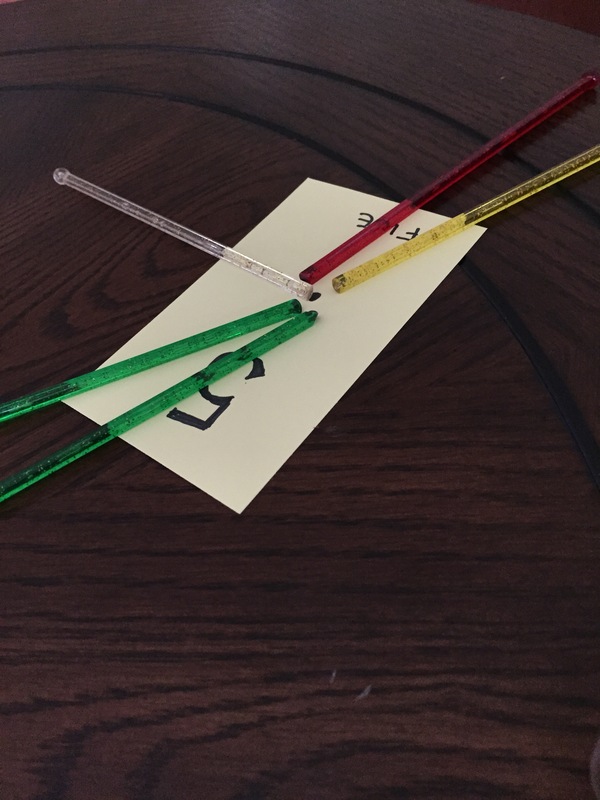 We used the stir sticks the same way and we used the sticks to trace the numbers like an ink-less pencil. We even sneaked in a little bit of simple maths (addition). Uh oh Tiger Mom alert! Poor kids. 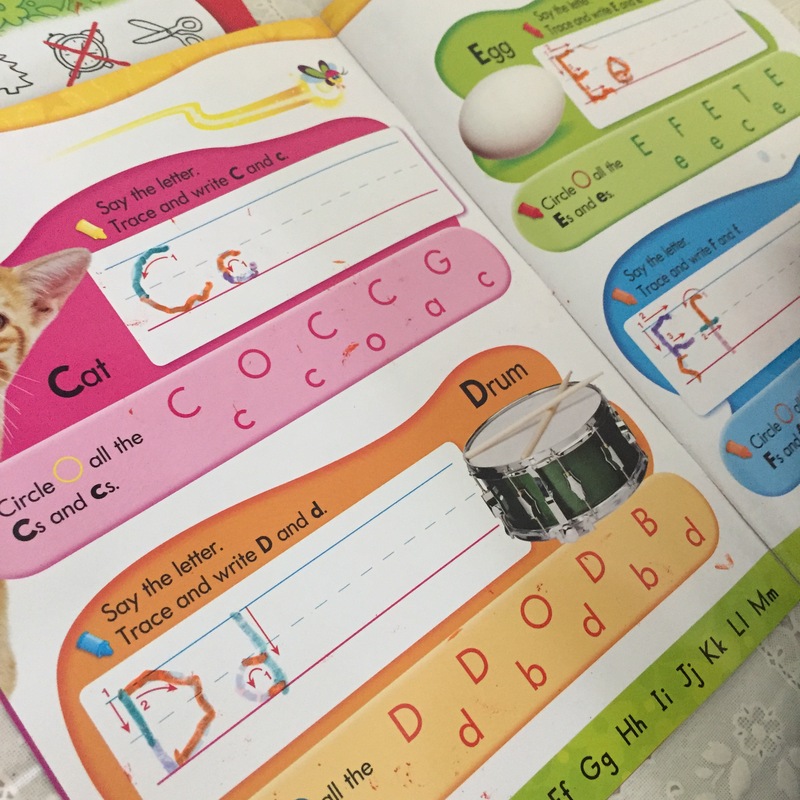 We’ve bought these activity books before but after our recent influx of tracing letters and numbers, J and N have refreshed their interests in these. J has been addicted! I couldn’t believe how his tracing improved so much in just a week. It was like he went to bed and woke up a year older! I also found some good ones on Amazon by Roger Priddy. 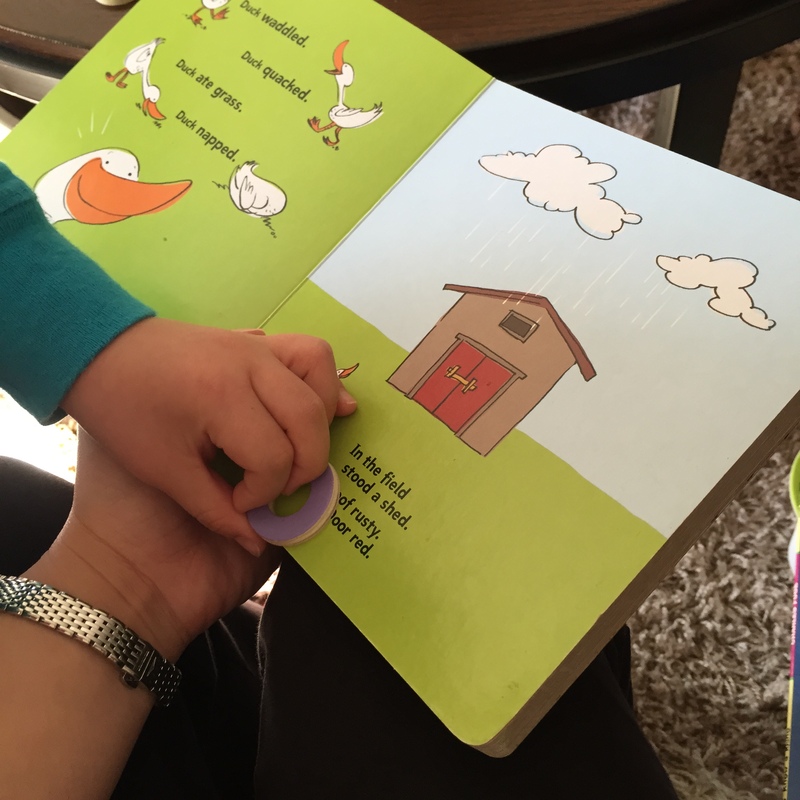 Love it when you can see good results from all the hard work for both parent and child! Happy learning everyone! 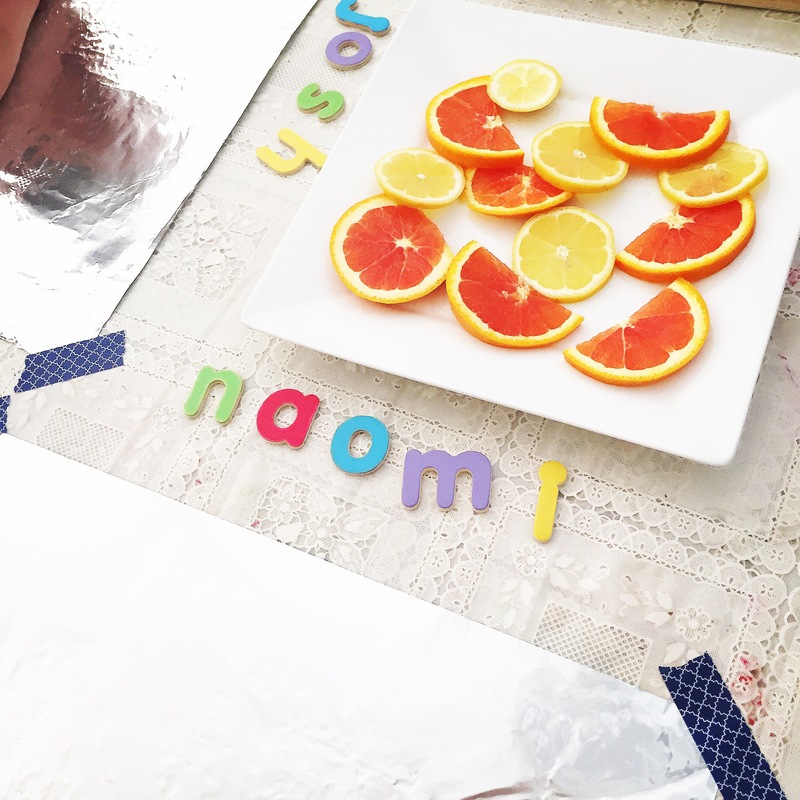 I’ve been a bit quiet on the blogging front but it doesn’t mean we haven’t been busy! 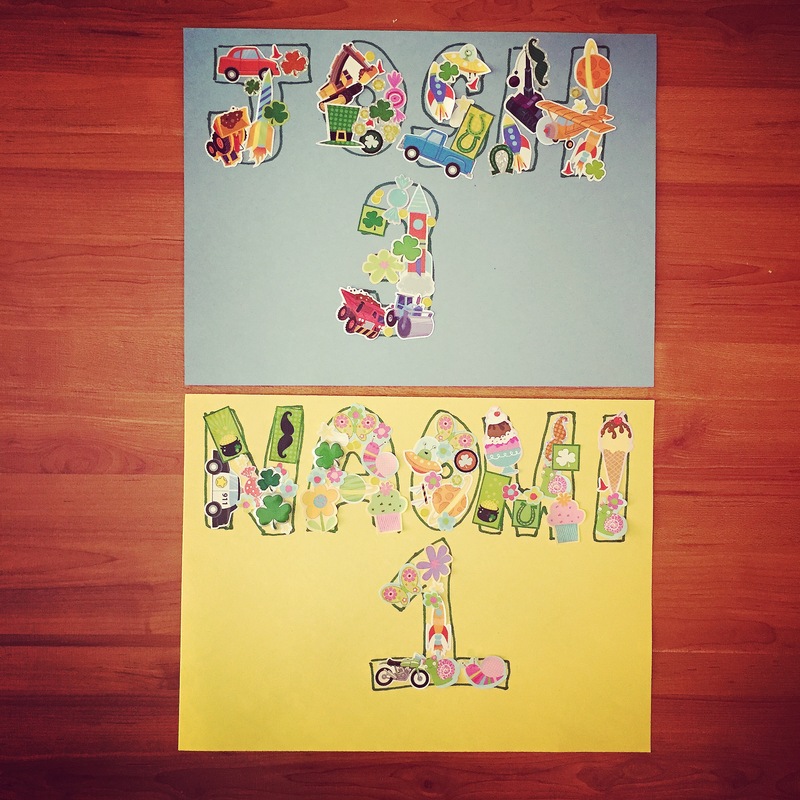 Aside from Easter celebrations and activities, we did heaps of learning activities to help the kids learn to recognize their names, spell their names, and write their names. 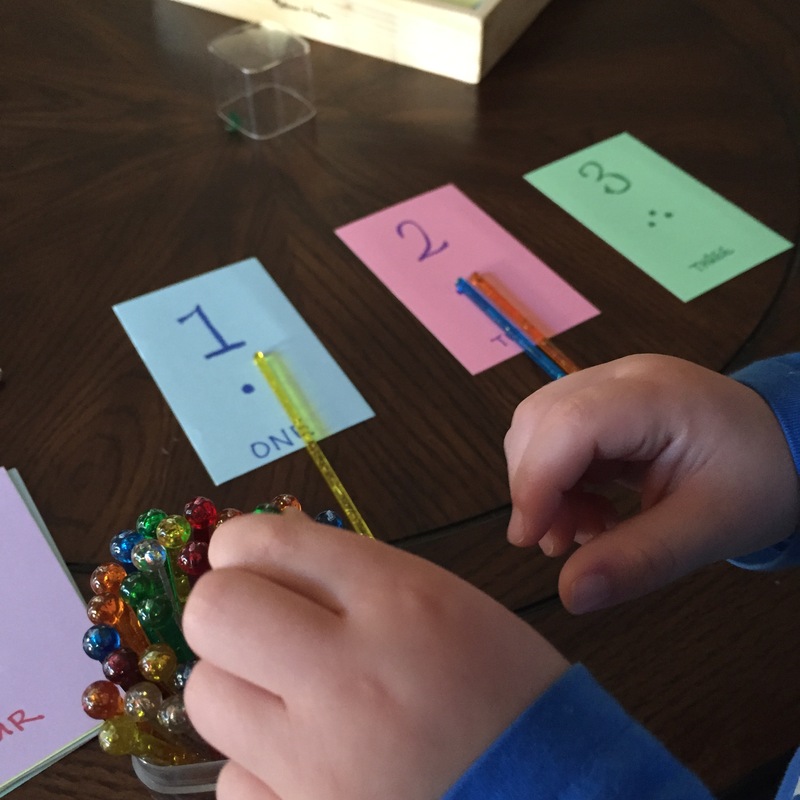 On top of that, we are also practicing our numbers and counting! 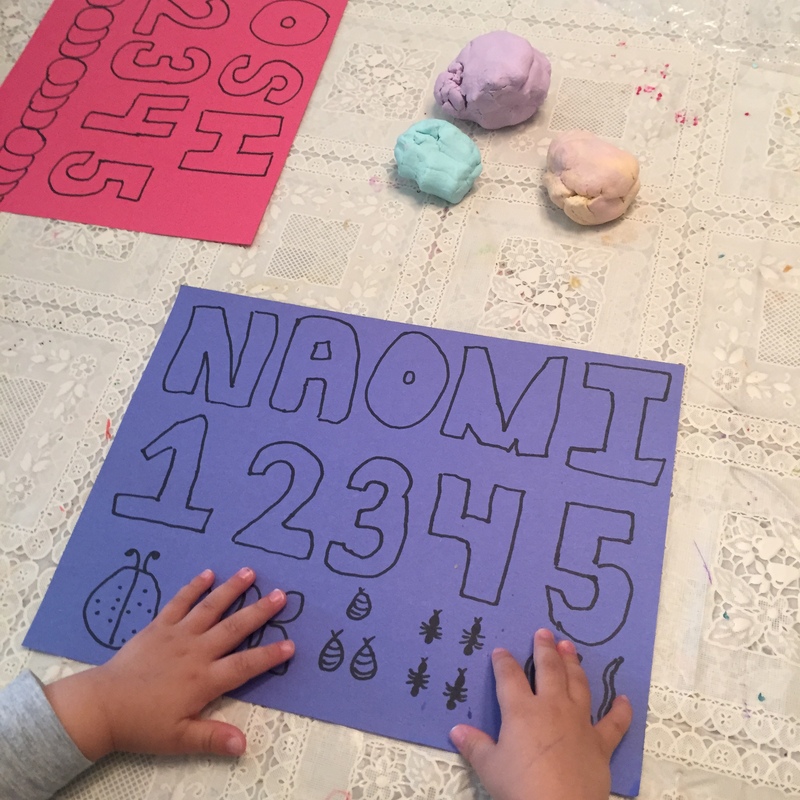 Here are some fun AND easy activities to do with toddlers to help them recognize, spell, and write their names and numbers! 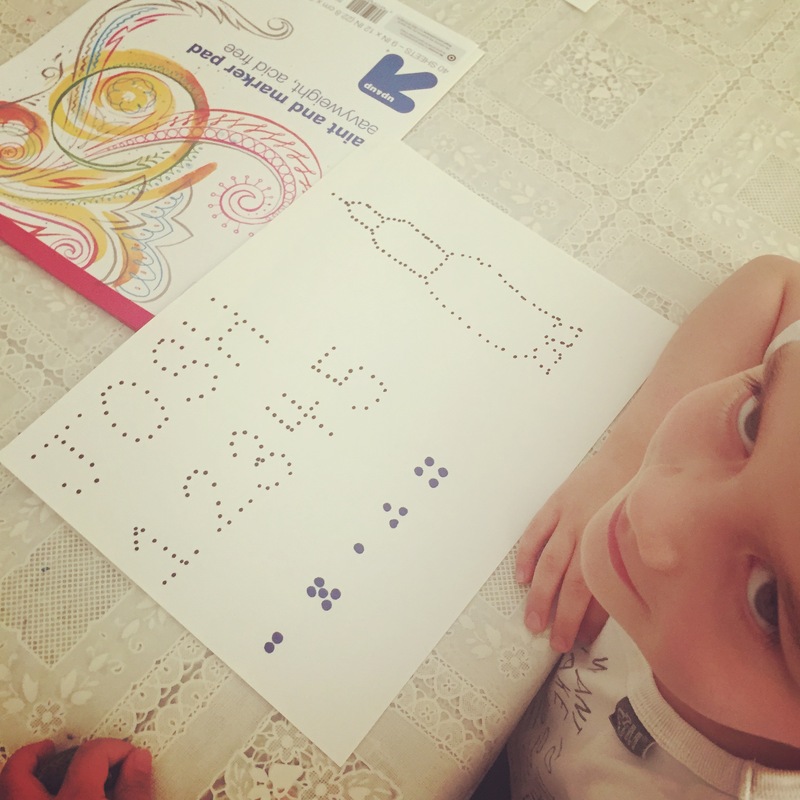 Josh LOVES rockets. 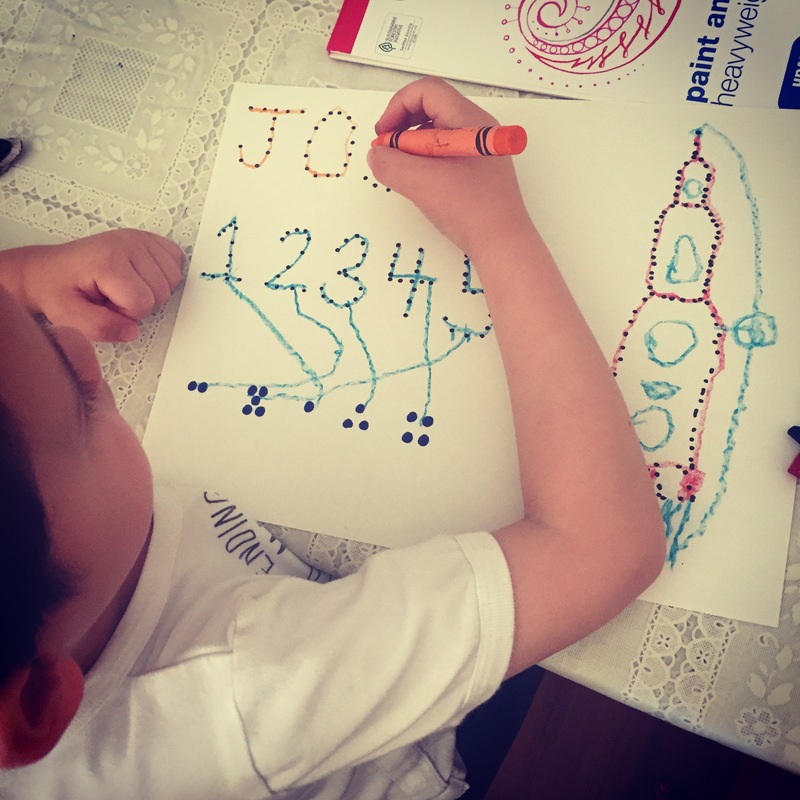 He also loves drawing. However, he hesitates sometimes because he recognizes the fact that his drawings are not yet recognizable. Although, having said that, they ARE becoming more and more recognizable. 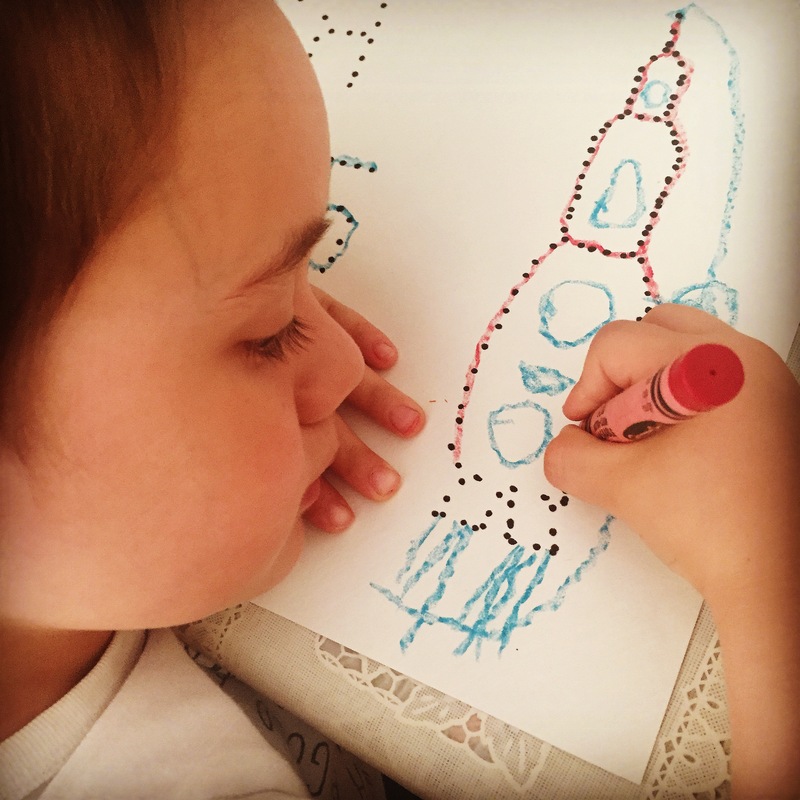 He’s been asking us to draw rockets and dinosaurs for him a lot. 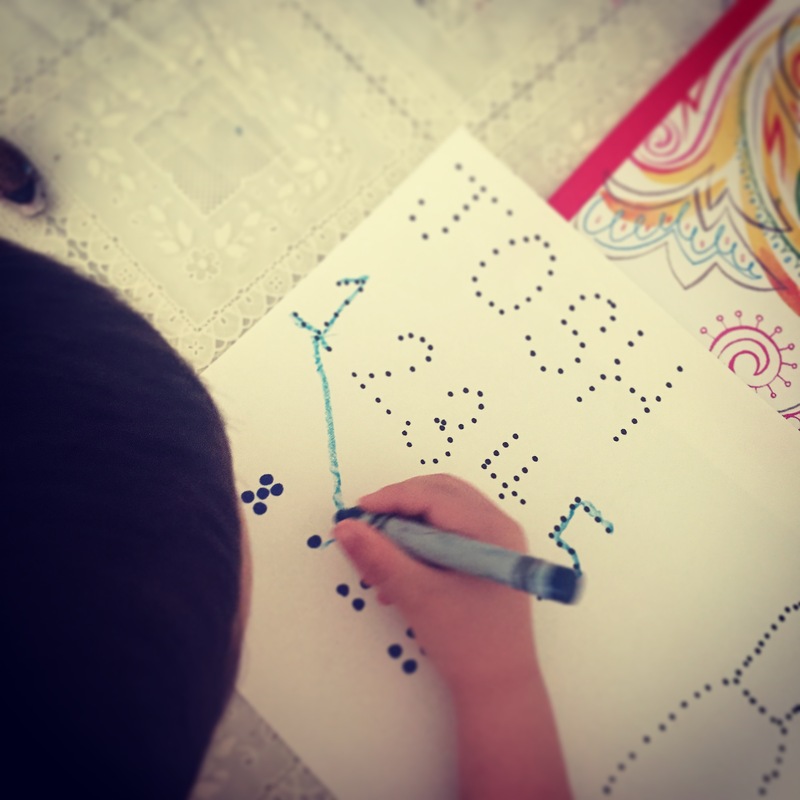 In order to encourage him to draw his beloved subjects, I thought I’d try drawing them in dots. 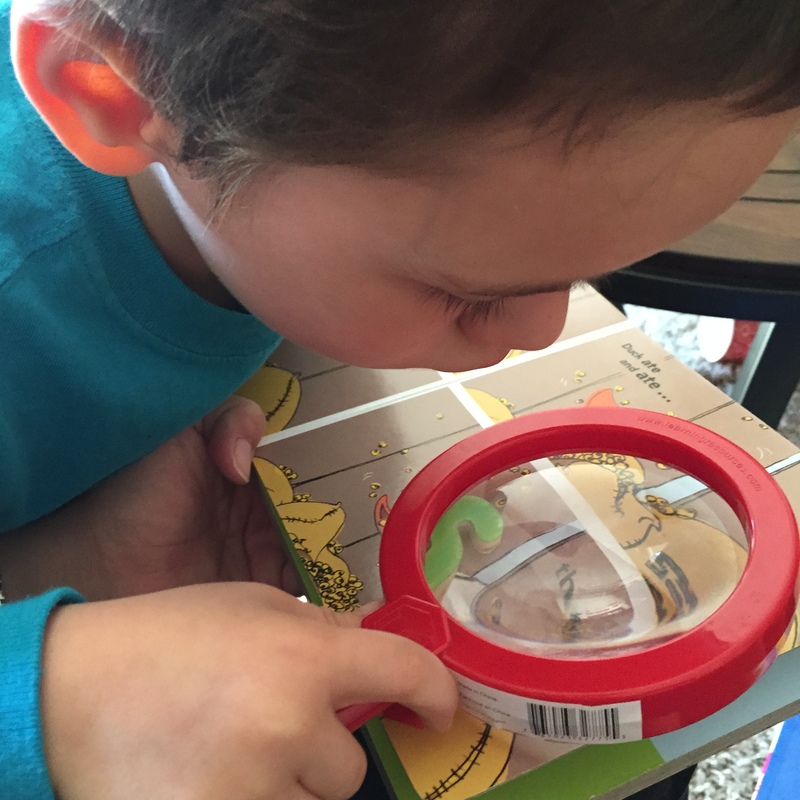 They’re close together, making it easier for him to recognize the picture and to trace. 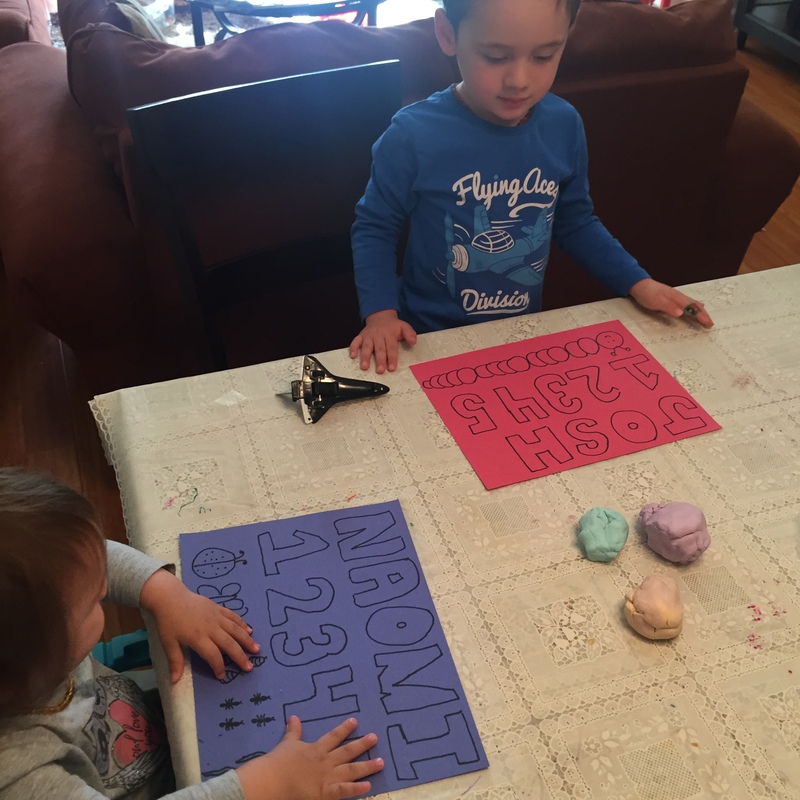 They were really excited to see this activity waiting for them! 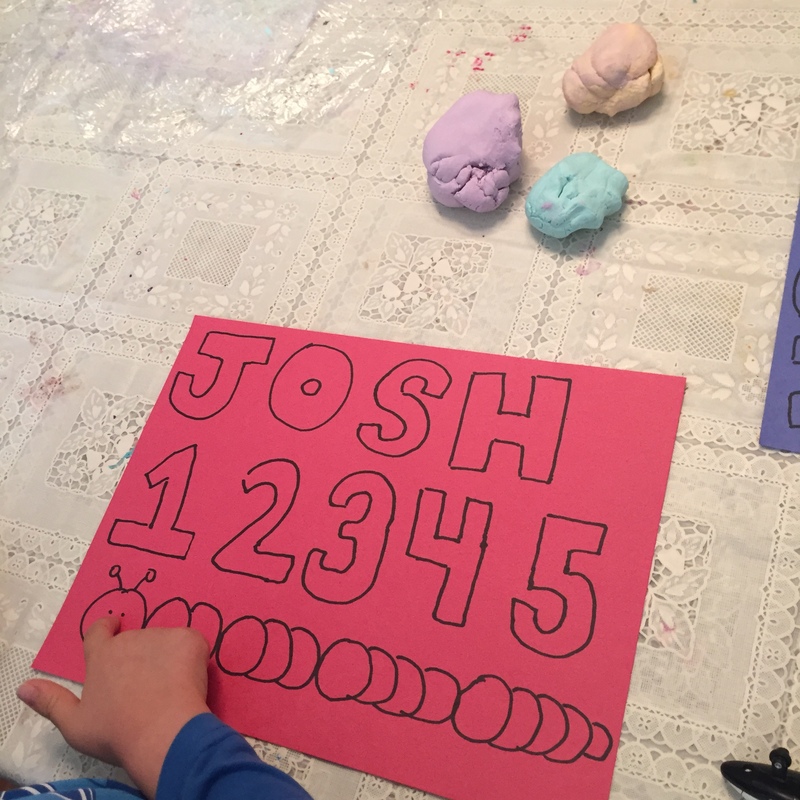 With Josh’s numbers, I drew groups of dots for him to match the written number to. 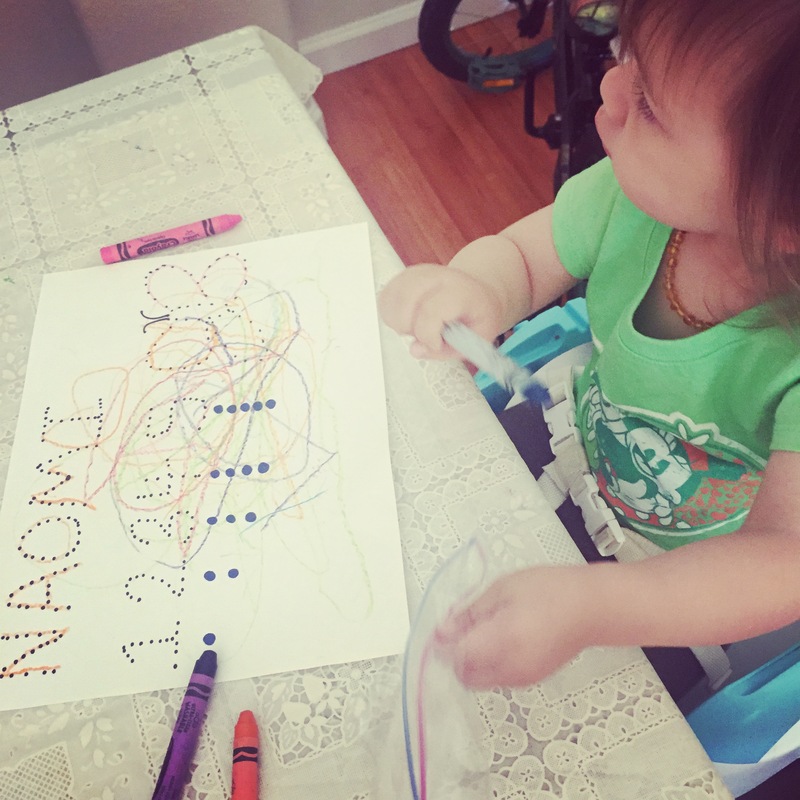 With N, I knew with her age, she doesn’t have the fine motor skill to do most of the tracing and match the dots to the written numbers. 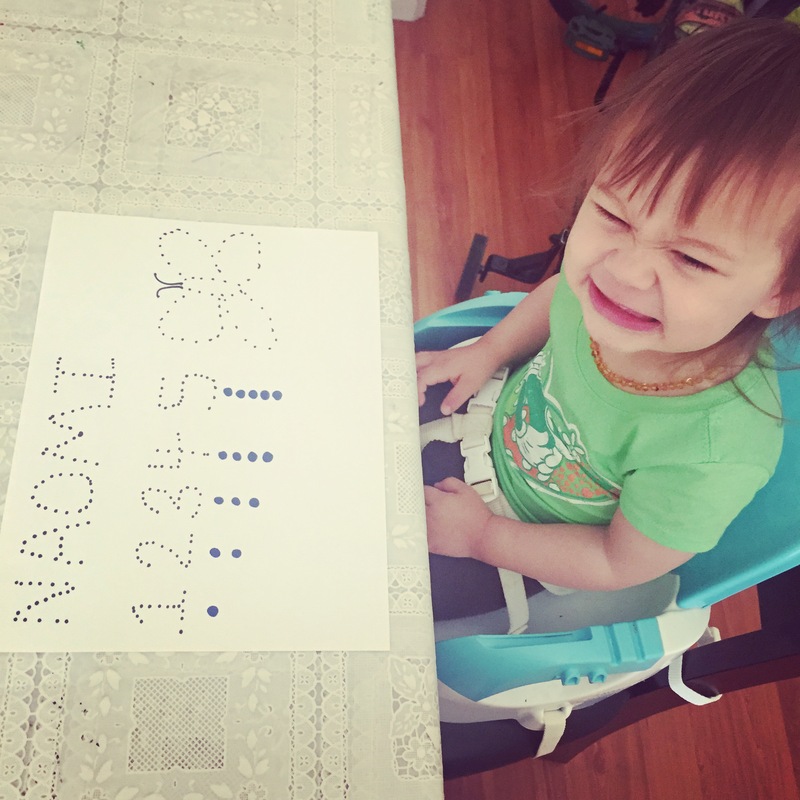 So instead, I drew the number of dots correlated to the written number. The idea is that the more she sees her name and the numbers, the easier it will be for her later on to recognize them. 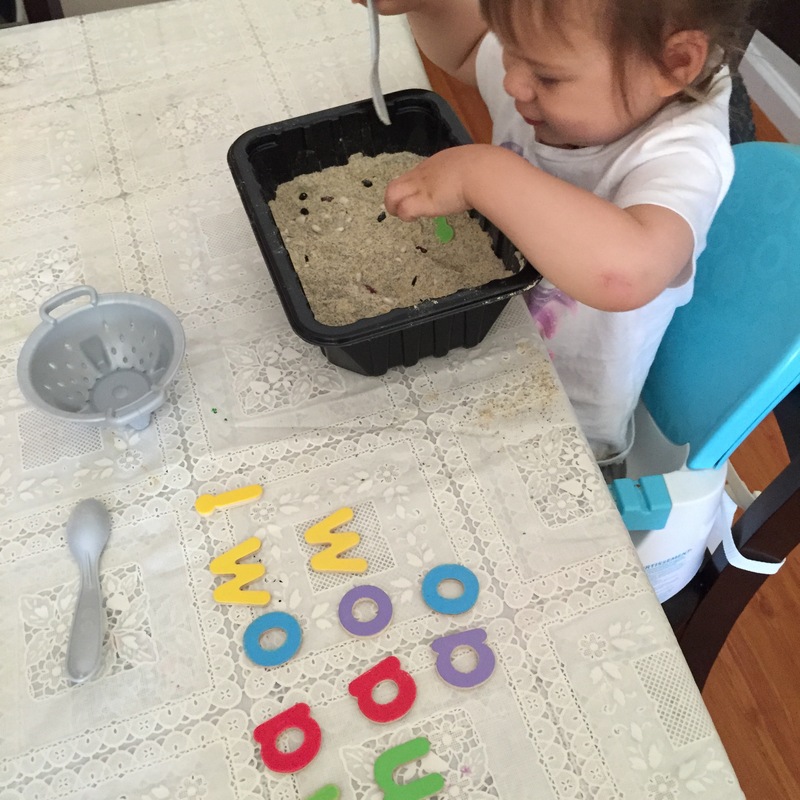 Using Play Dough (or Cloud Dough in our case) to Spell and Write! 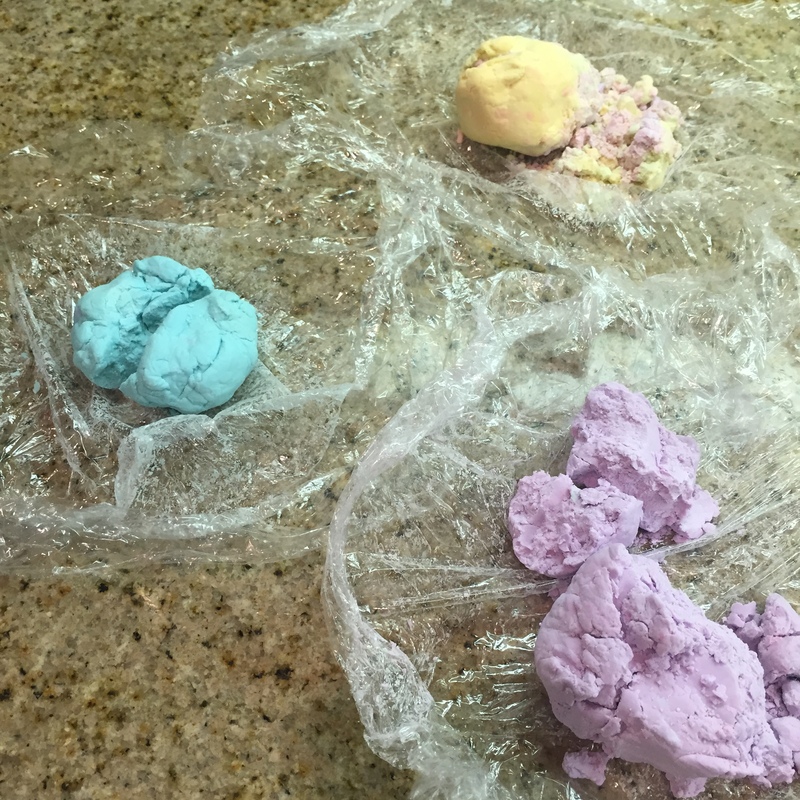 Back in February, I made some cloud dough out of apple conditioner and corn starch (flour). After each use, I’ve been storing them in glad wrap and zip locks. It’s been a while since we’ve last used it, so not surprisingly, they were a bit crumbly and dry. 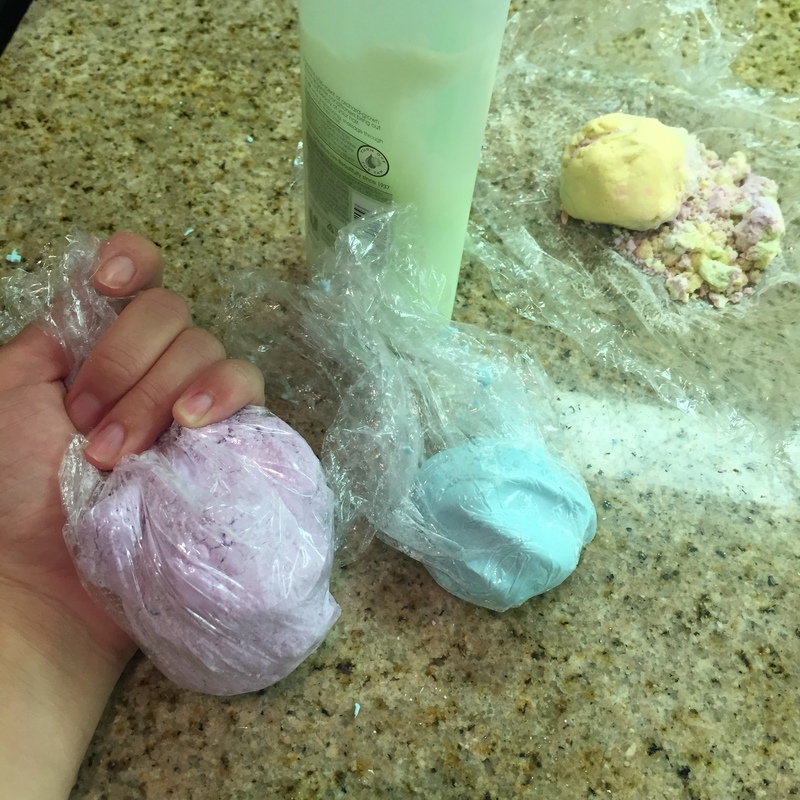 I added about a tsp of the same conditioner to each clump and mixed them in their glad wrap. 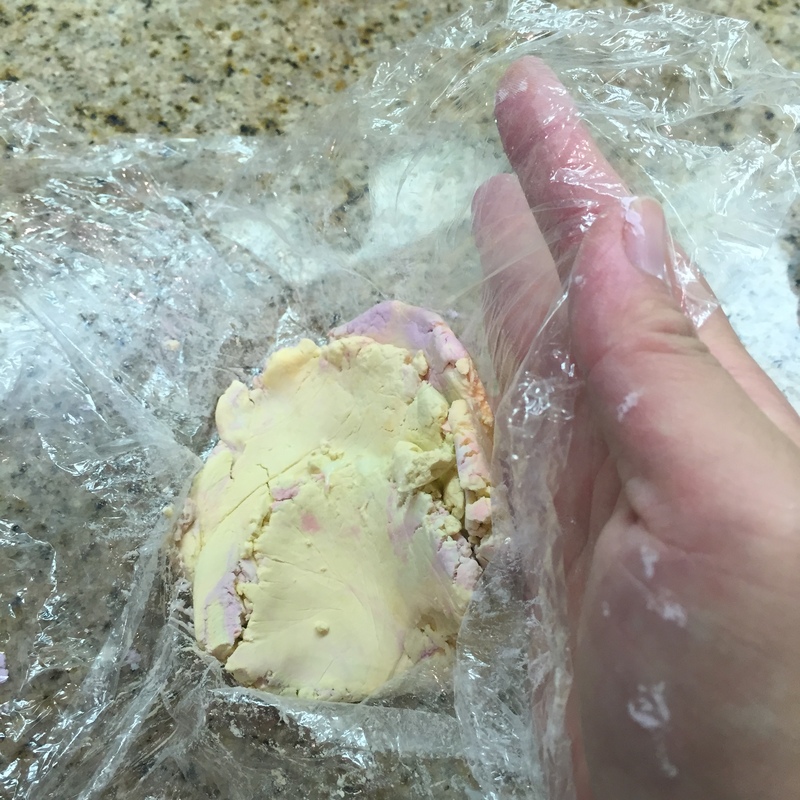 That kept my hands clean and you don’t lose any of the dough because they can stick onto your hands. I also drew some simple templates of bugs for them to use to mold their dough onto. 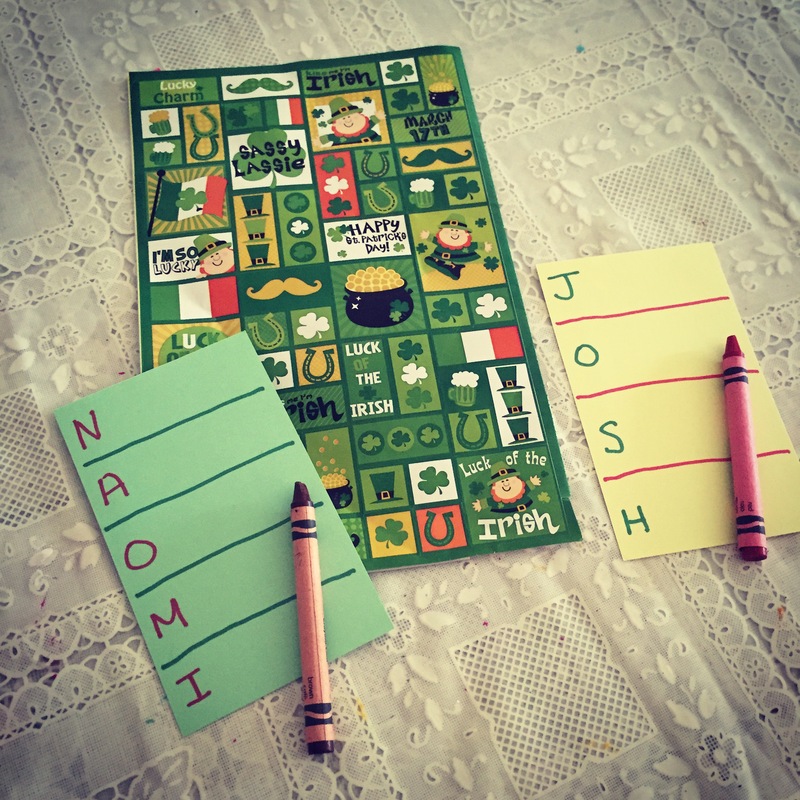 I had TONS of stickers leftover from St Patrick’s Day and Easter. 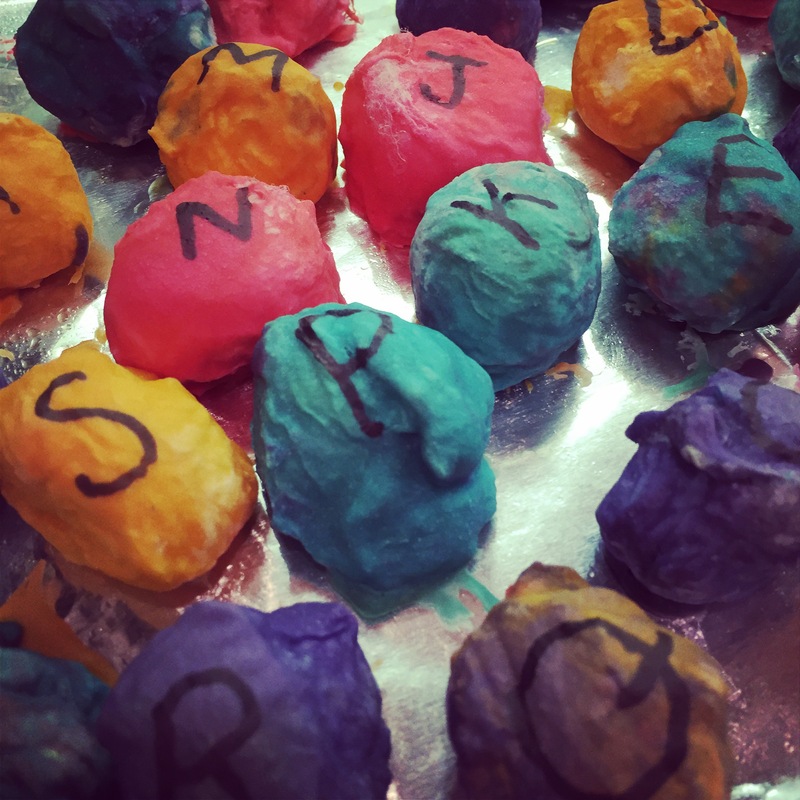 So instead of keeping them in my art supply box for another year, I thought I’d let the kids use them up for this activity. 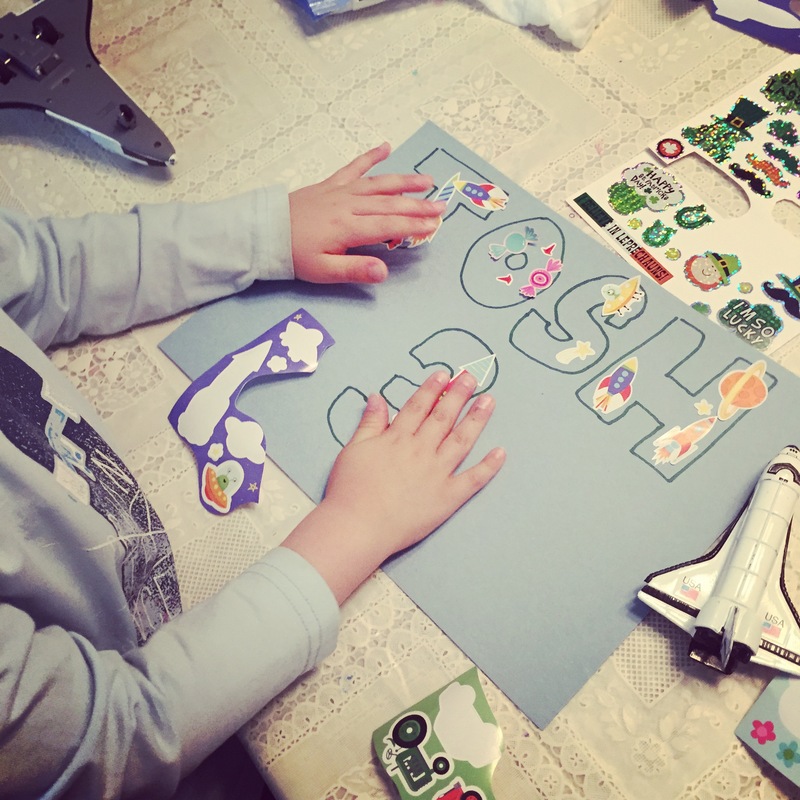 They do love stickers! They turned out so pretty! I wish I could laminate these. When I have more free time, I’ll post Part 2 of 2. 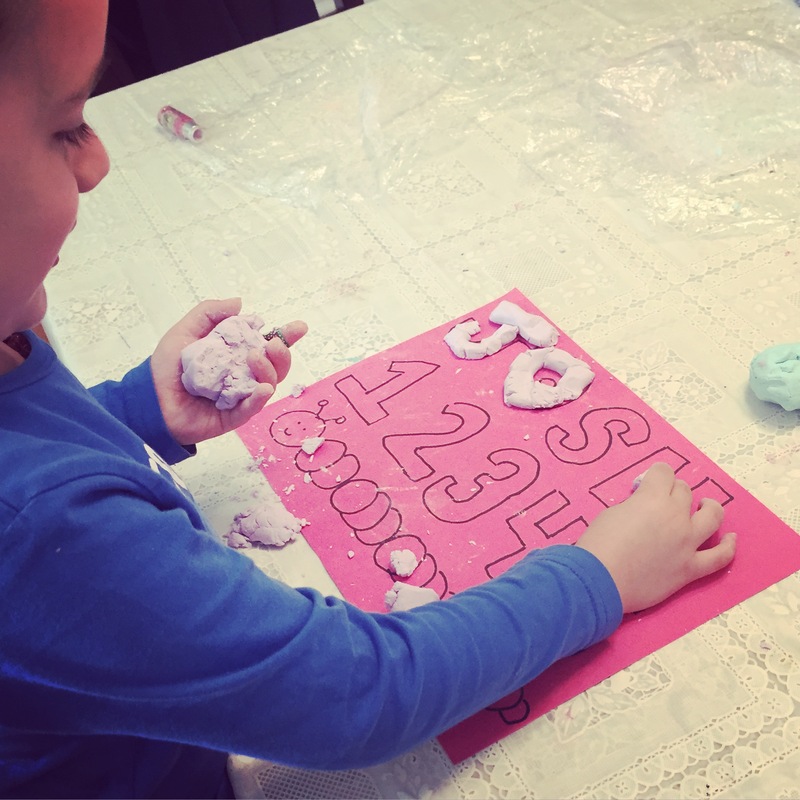 We did so many fun activities to help them learn their names, alphabet, and numbers. More to come! 1. 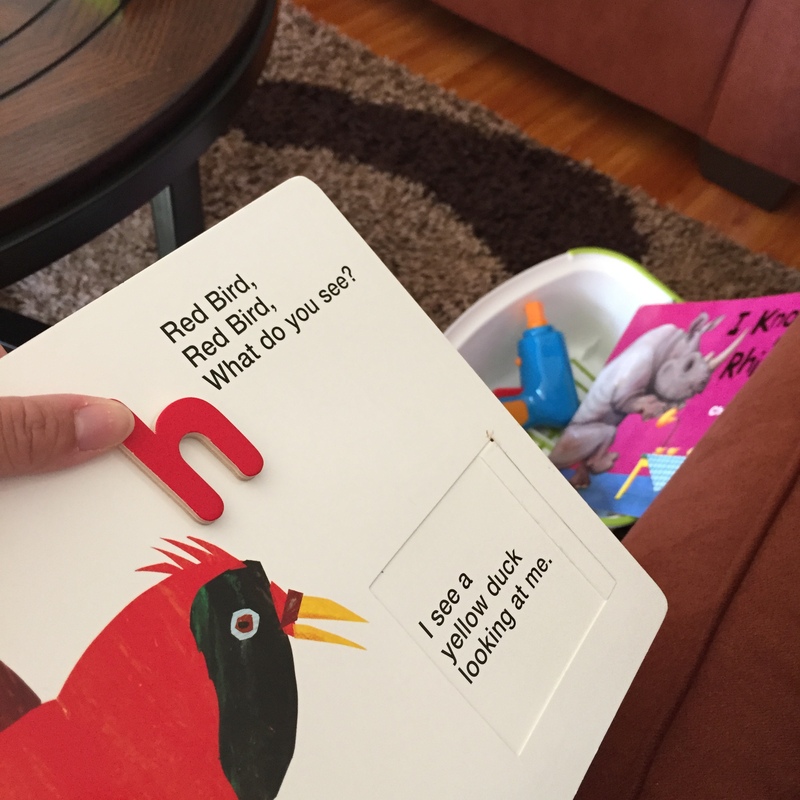 Reading Game – I Spy the color/letter…. 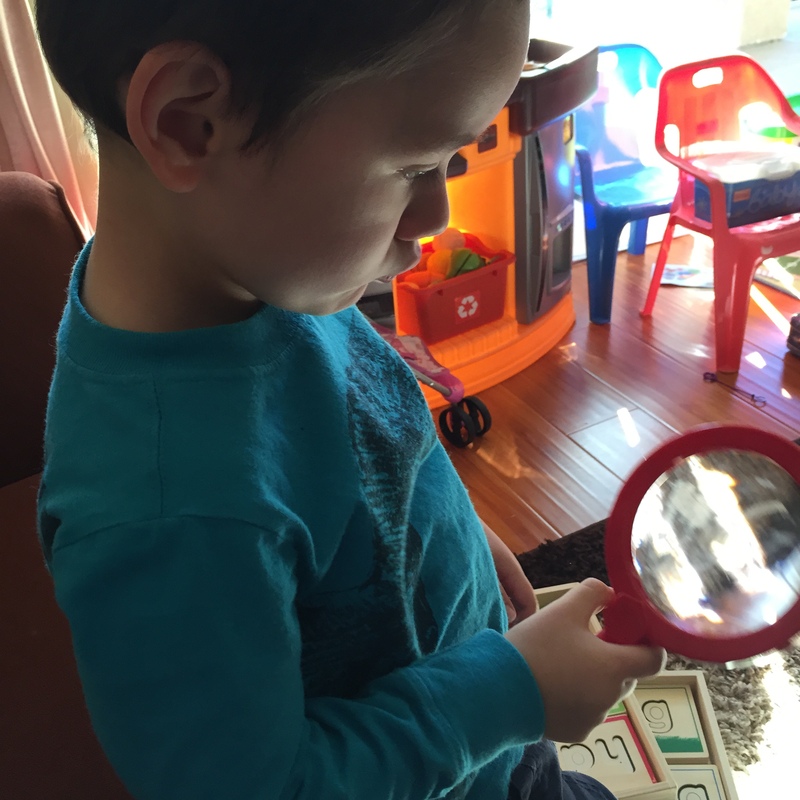 I’ve learned that kids love interactive shows like Dora, Mickey Mouse Clubhouse, Jake and the Neverland Pirates….the list goes on! 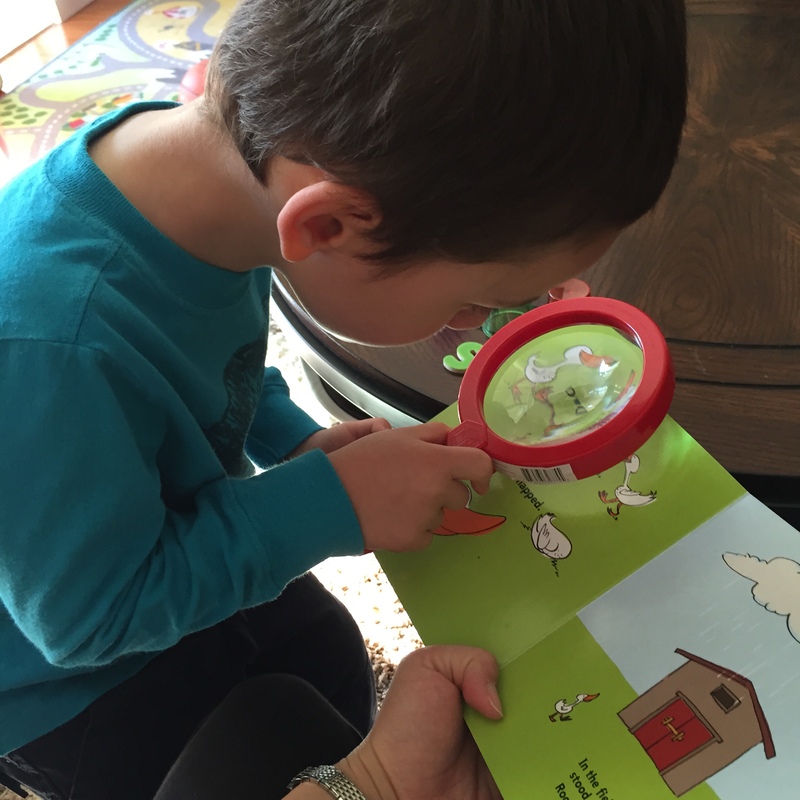 They also LOVE a good game of “I Spy.” Why not incorporate that into reading? 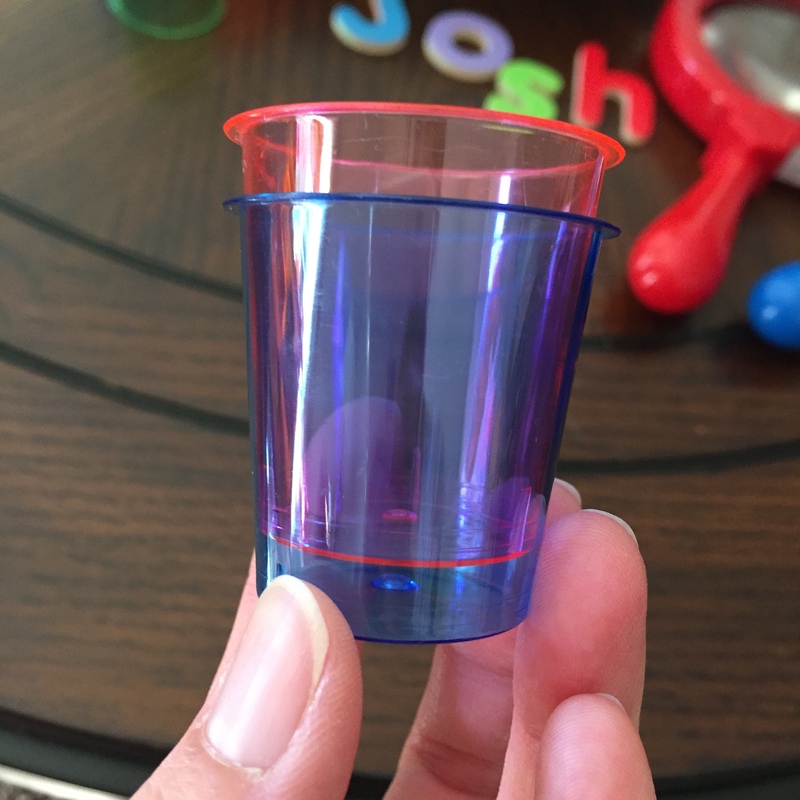 We didn’t have a purple shot glass to match J’s purple letter “o” so we used this opportunity to learn a bit of basic color theory. Red + Blue = PURPLE! 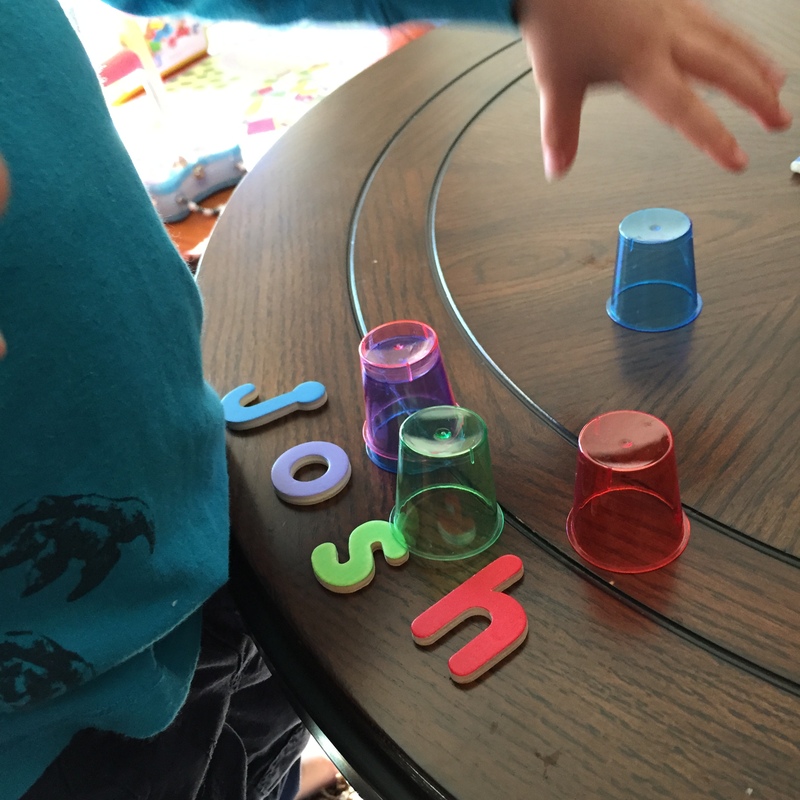 Here J is matching the colorful glasses with each of the colored letters. What’s this? 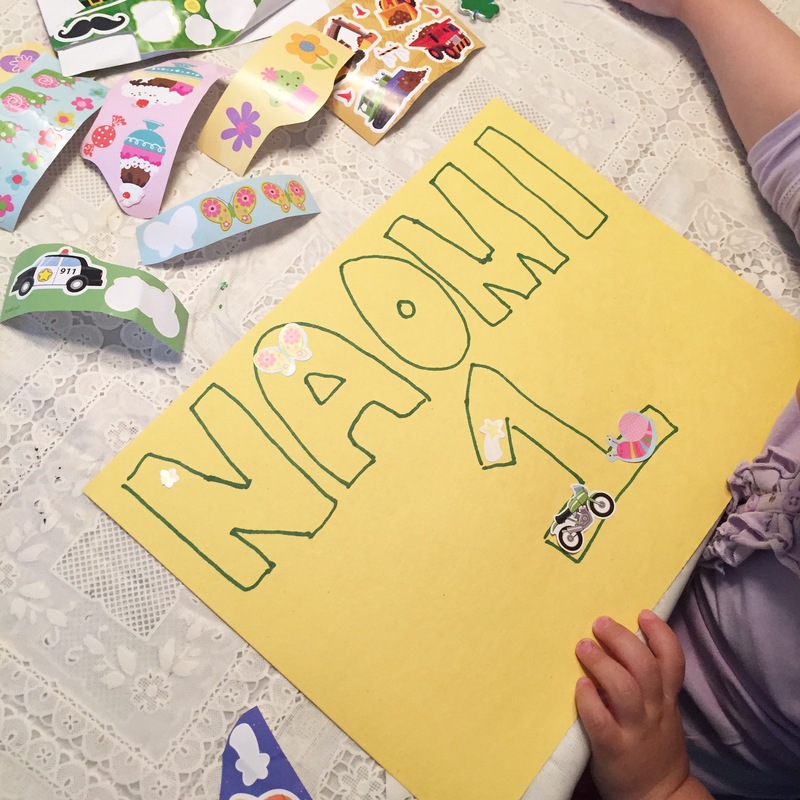 We’ve already spotted a letter from our name! “S”! 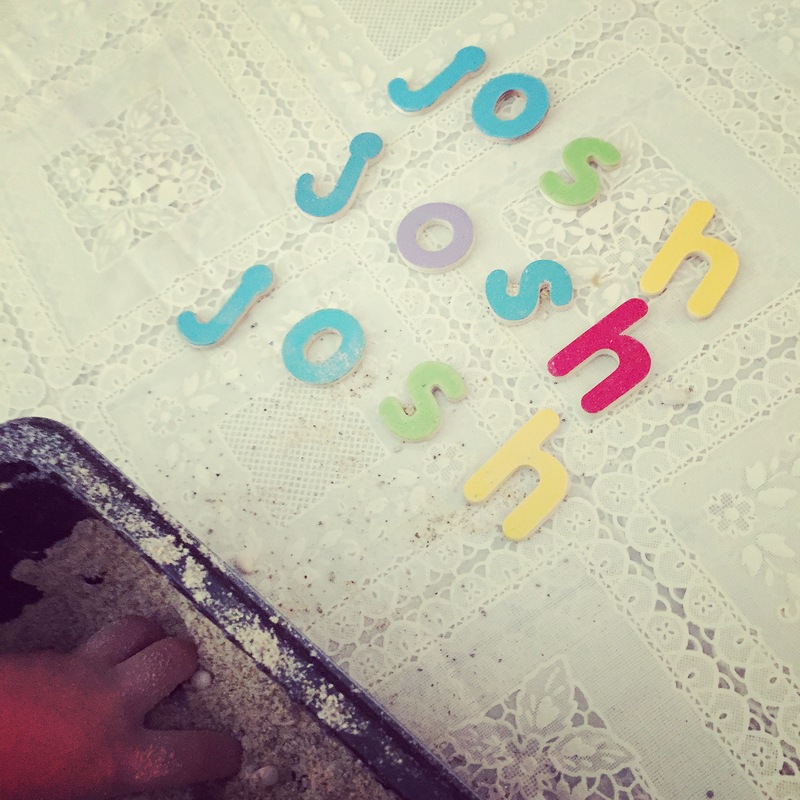 J having a closer look at the text to spot any other letters from his name. 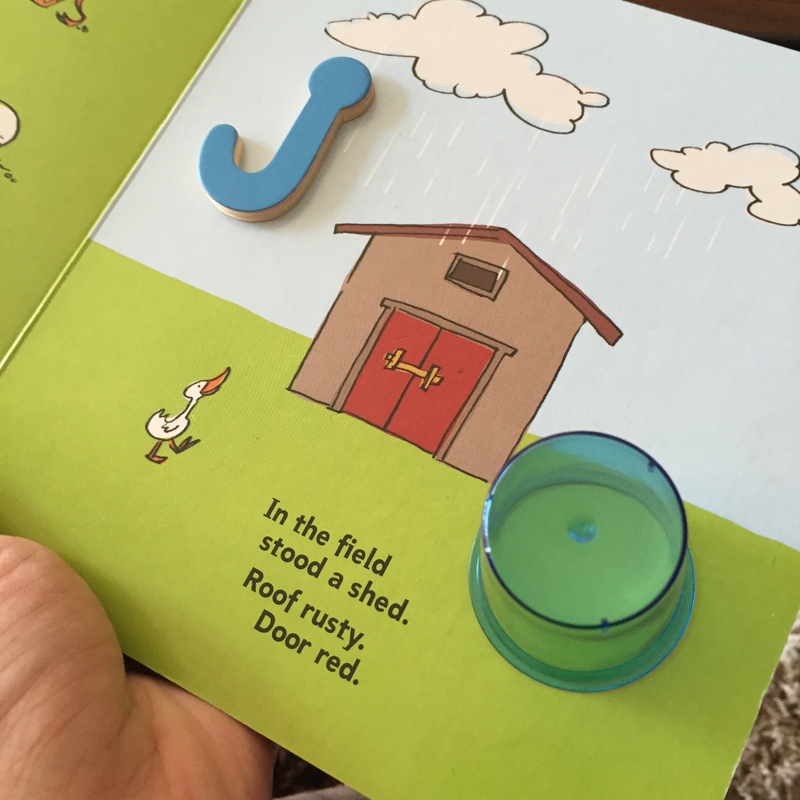 Here he is matching the blue sky in the illustrations with his blue “j” and blue plastic glass. 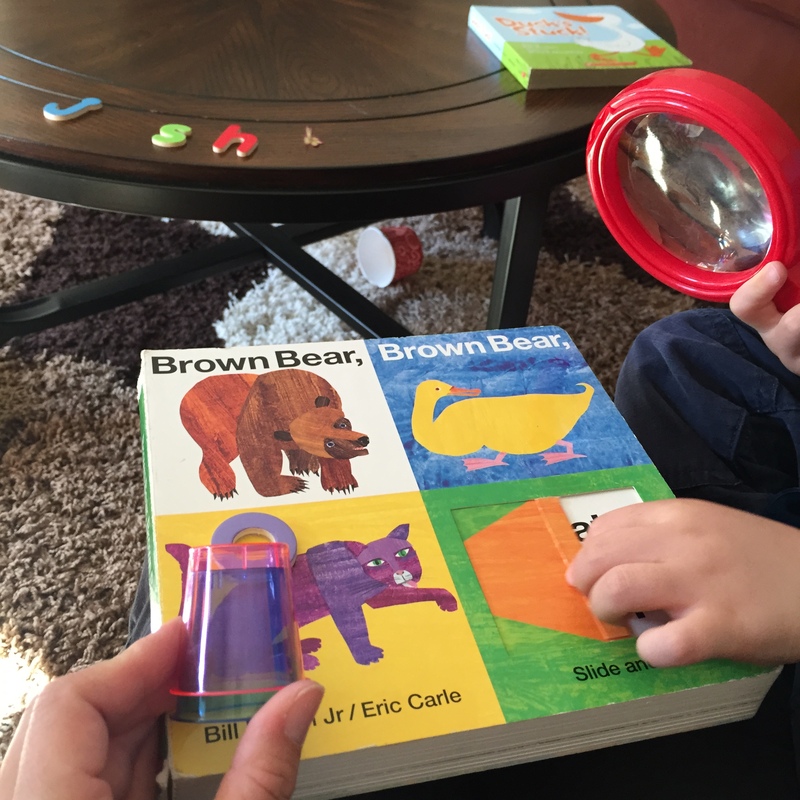 Brown Bear, Brown Bear was the perfect book to do this activity! 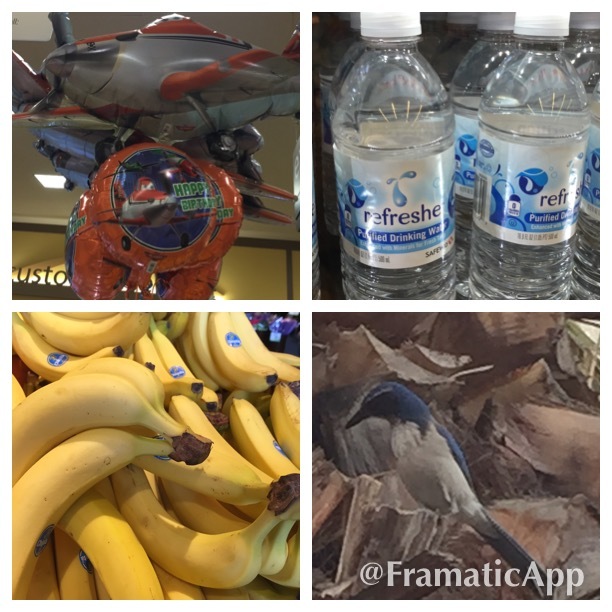 This is revisiting an old post. 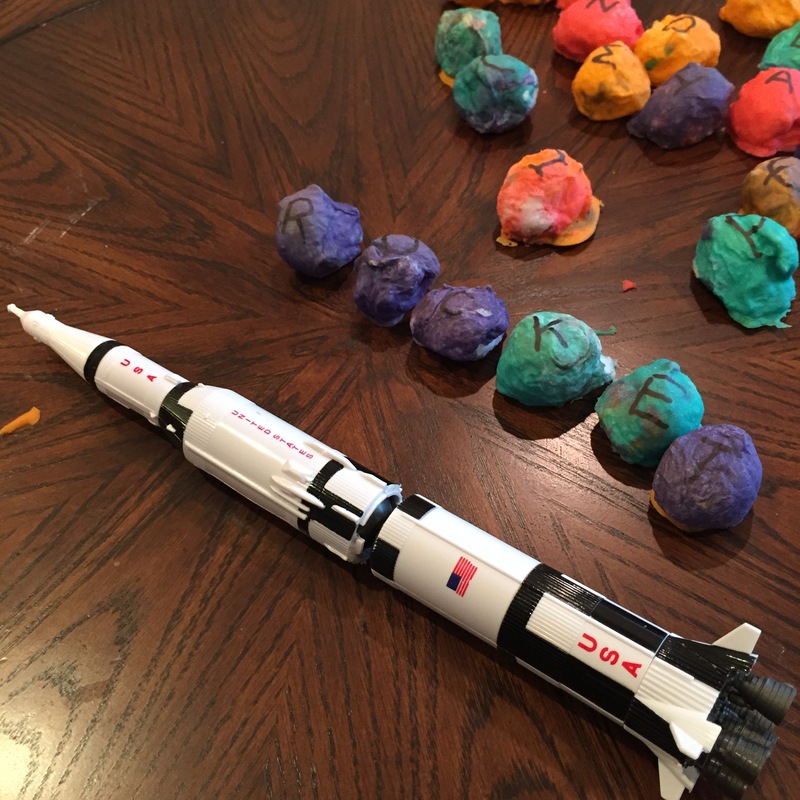 These are easy and fun for the kids to make and it’s even more fun when they smash them! 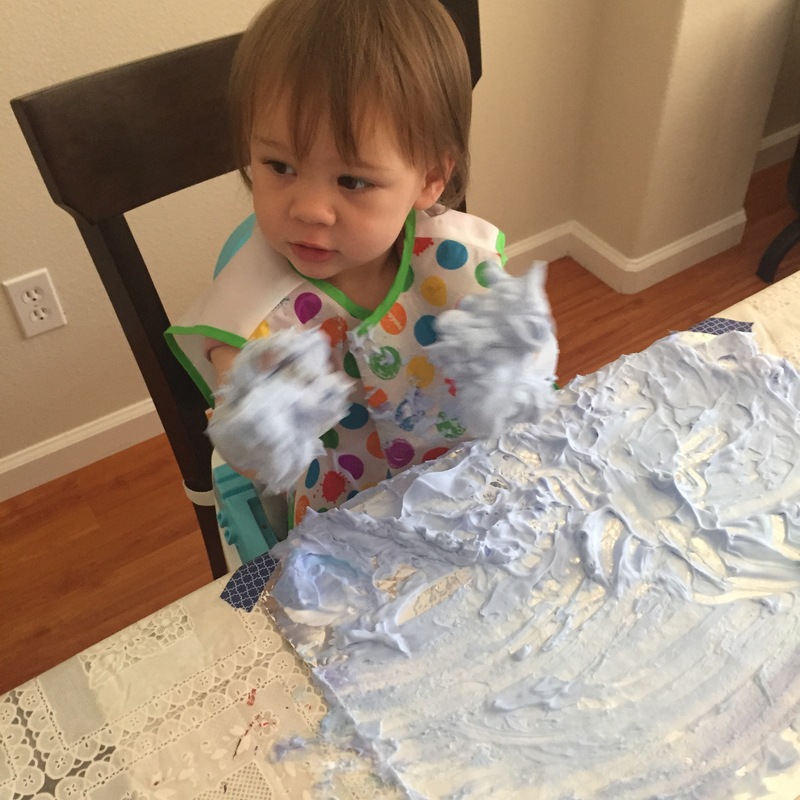 WARNING: This is a messy activity!! Here is the link to the post. 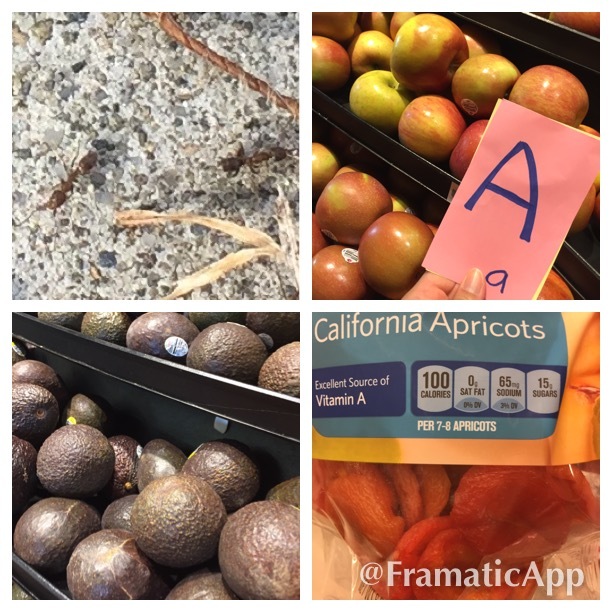 I walk the kids to our local shops every week to get some miscellaneous grocery items. Sometimes it can become a bit of a struggle as they tend to get restless and don’t want to sit quietly in their prams as I get our shopping done. So I thought I’d give them a little (educational) task! 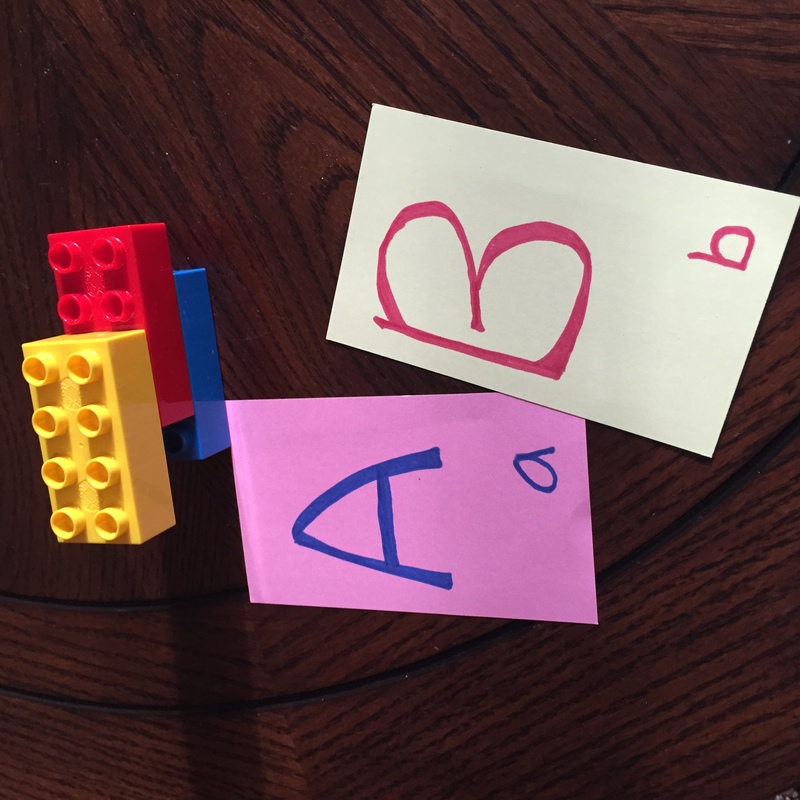 I wrote two letters down in upper and lower cases and asked the kids to spot anything that would start with “A” and “B”. 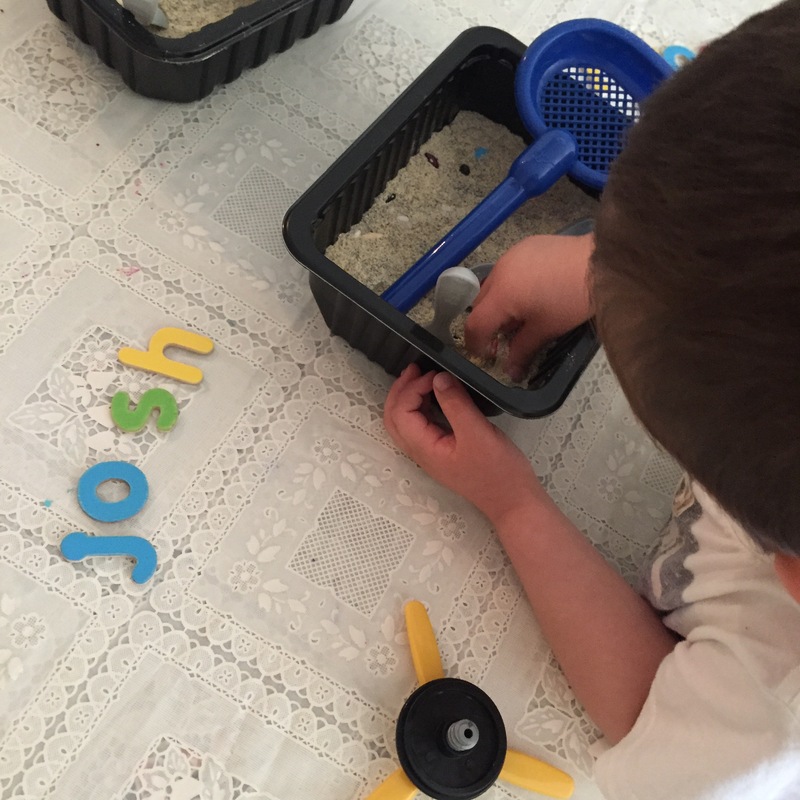 Yes, they’re too young to know, but I’d point them out to them and reinforce their letter recognition and word association by showing them the letter and the item we spot. 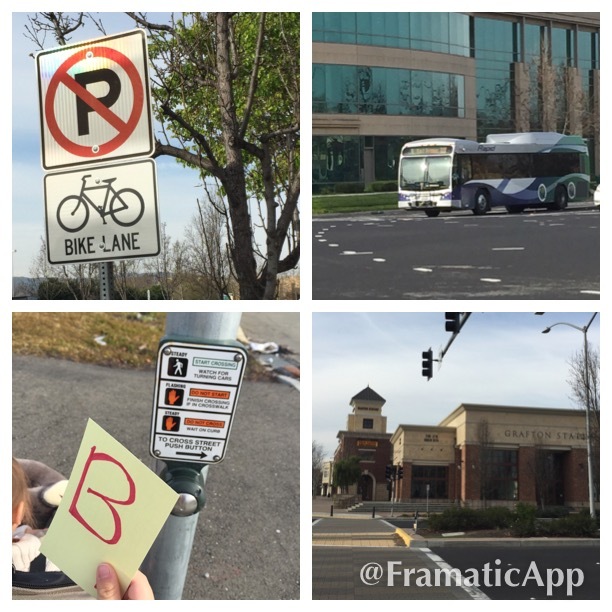 Let me just say there are A LOT more “Bs” in this world than “As”! No pun intended! 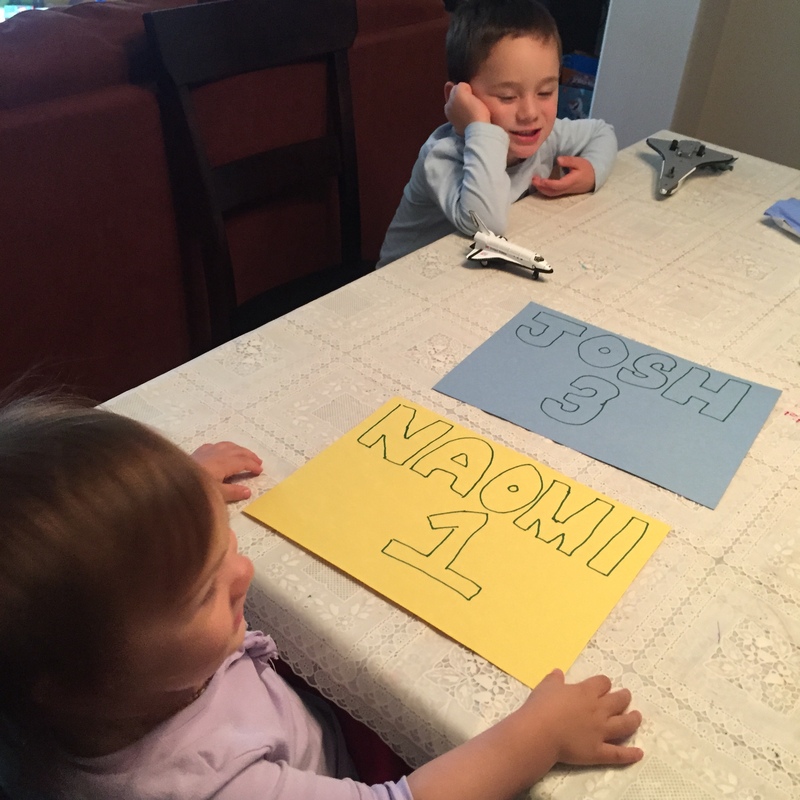 Again, I used index cards and spelled out the kids’ names. 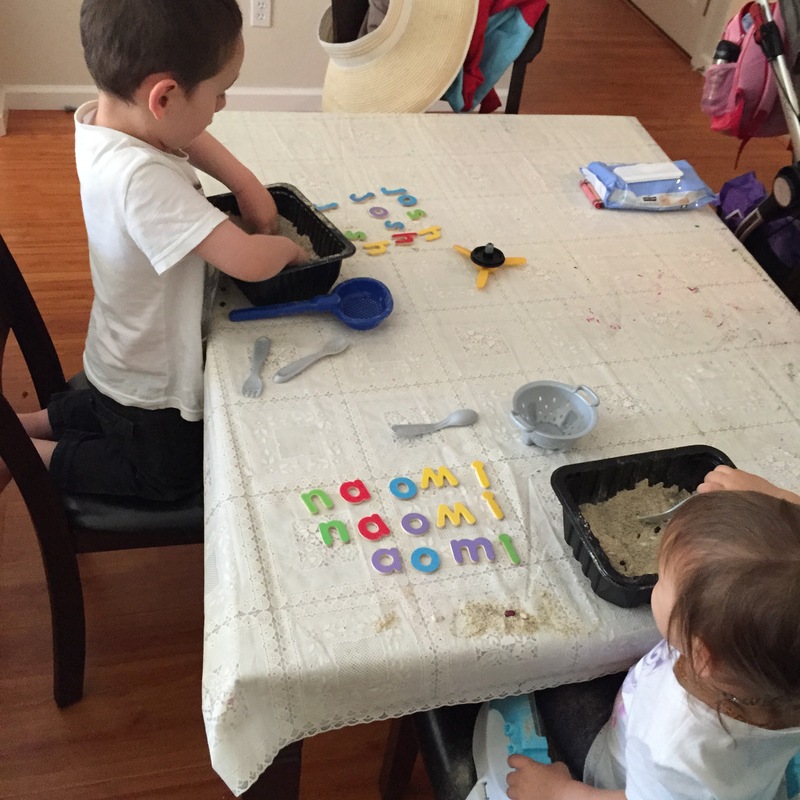 Initially, I had the idea of them tallying the letters as we go. 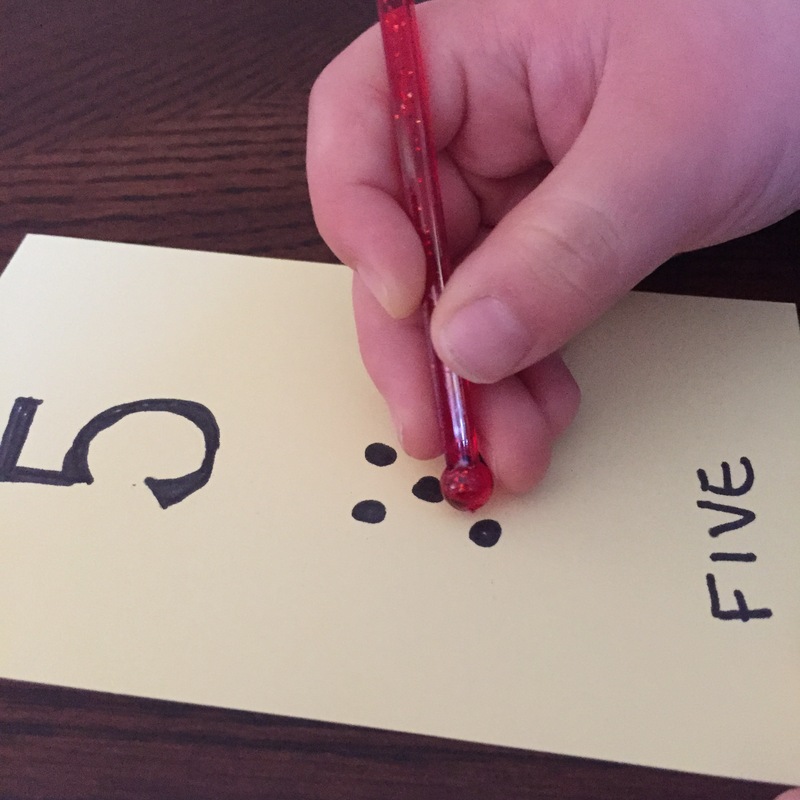 Every time we see something that starts with the letter “J” we’d make a tally with the crayon. Then I thought maybe using stickers may be more age appropriate and more fun for my kids. Plus, I had heaps of St Patrick’s Day stickers leftover! 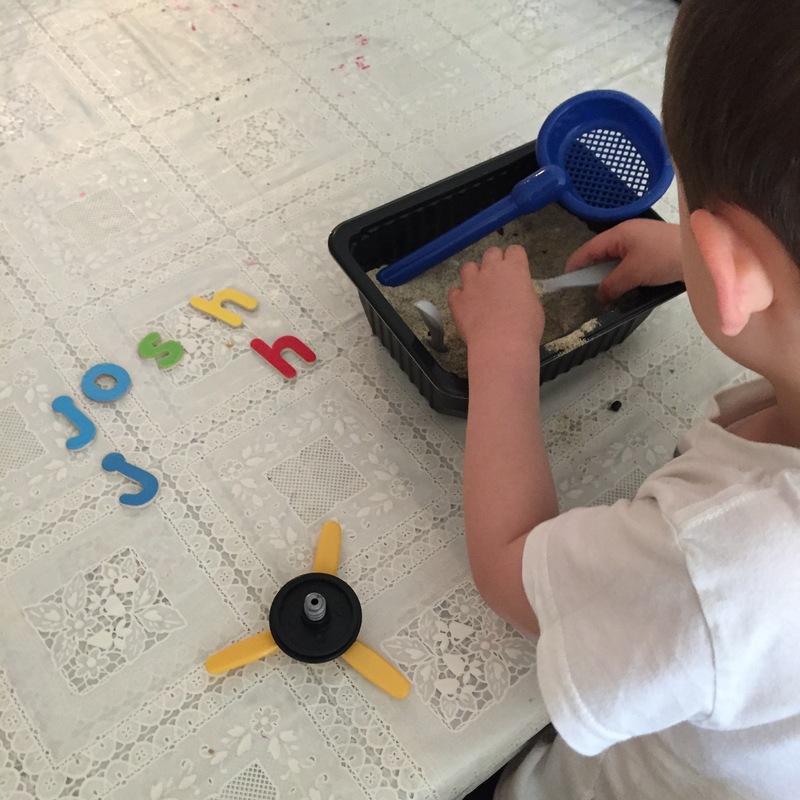 Josh is doing well spotting the letter “J” in “juice”! 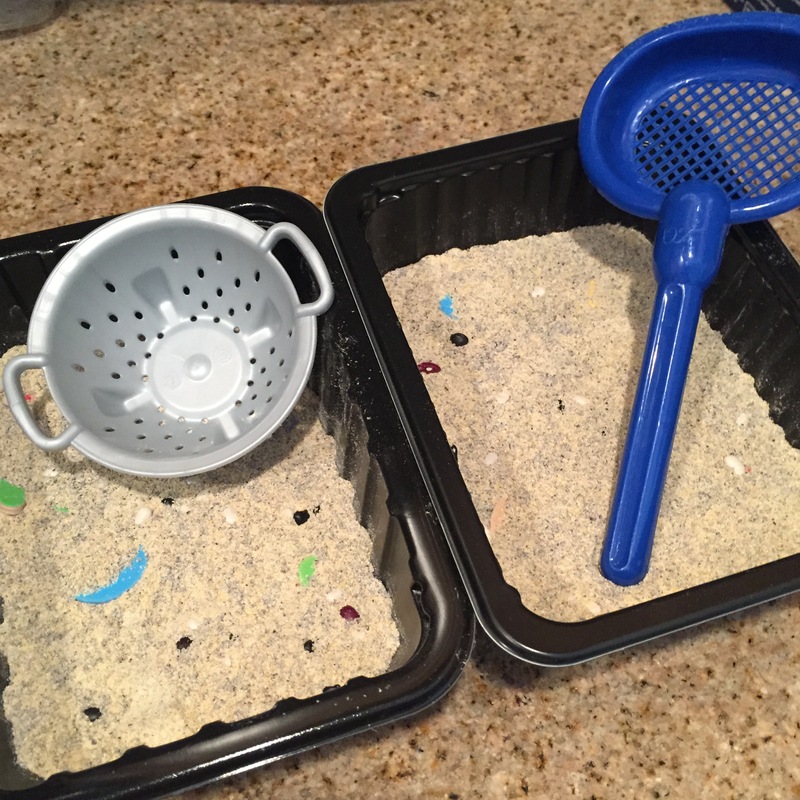 I got my pre-made homemade sand (see previous post via link for recipe) out and split it into two trays. 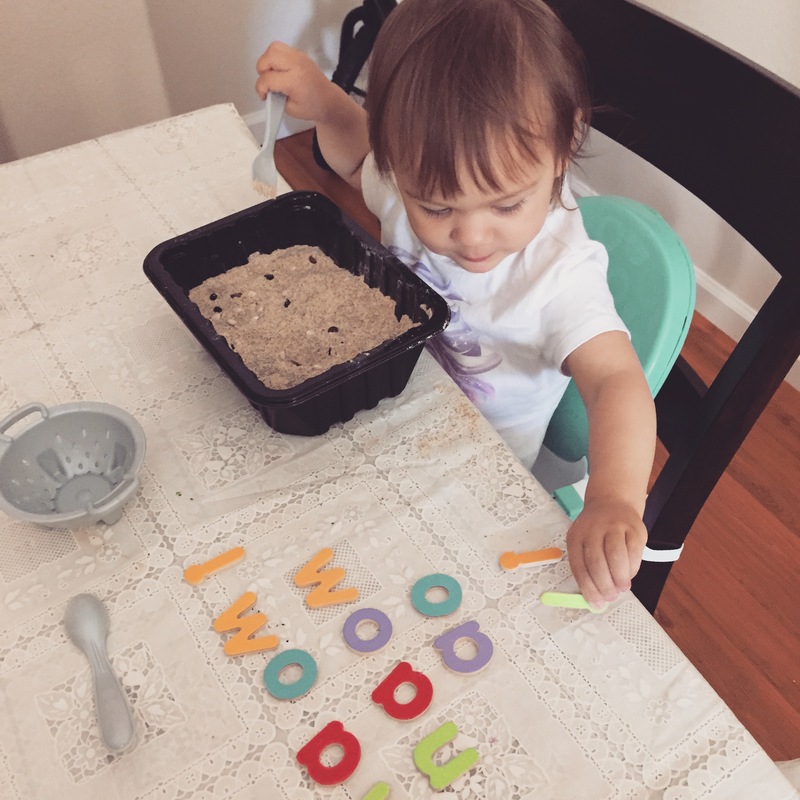 I hid two sets of the kids’ names (Melissa and Doug wooden letters) and kept one set out so they can visually spell out their names and to match the letters they find. 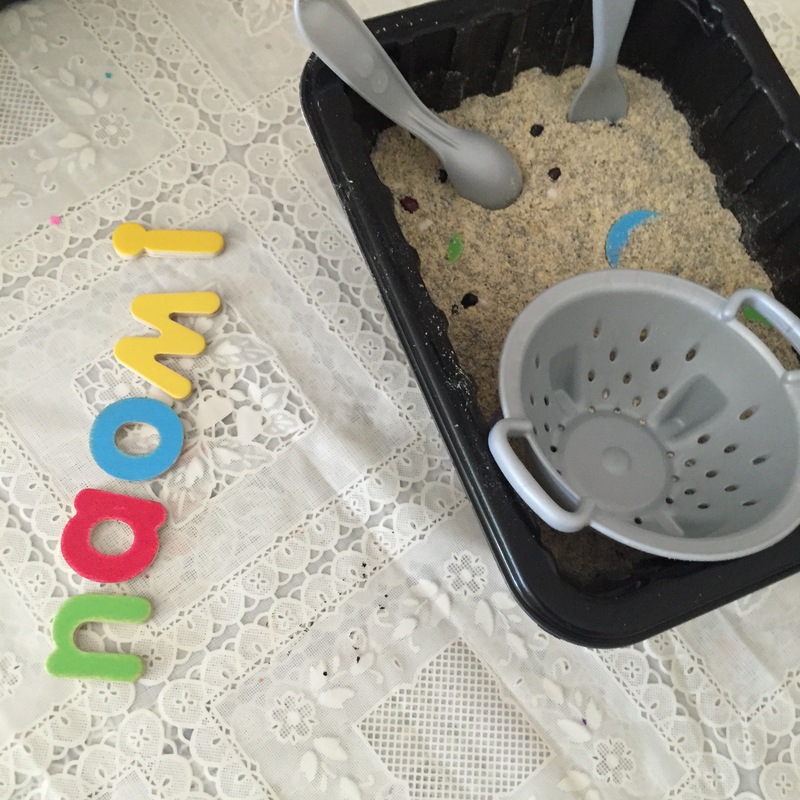 Some sifting tools for their excavation! Warning! Sand flying! 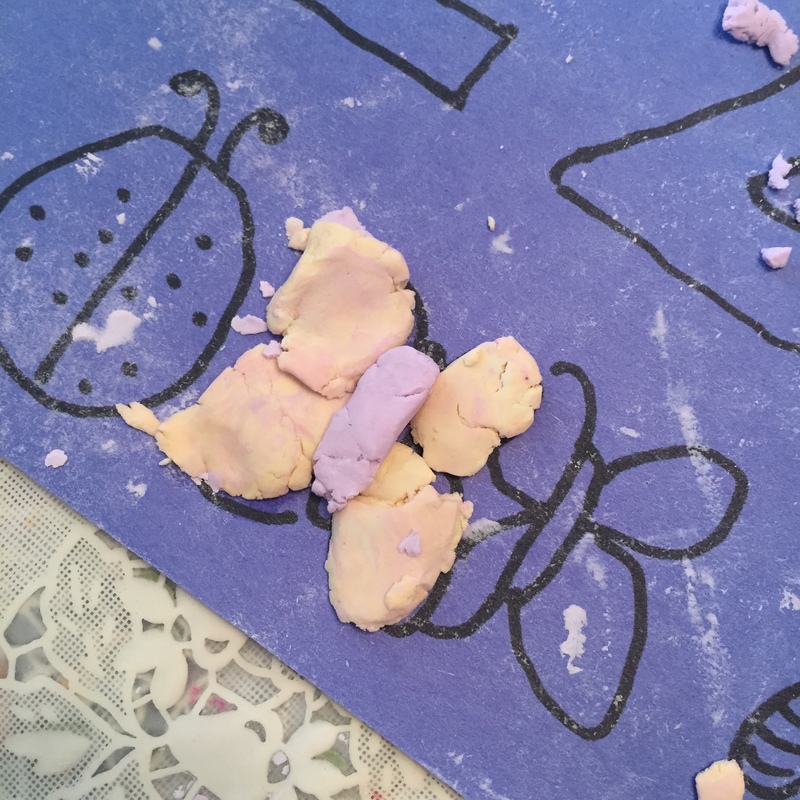 Be prepared for some mess especially with littlies! And don’t worry. Just sweep or vacuum later! 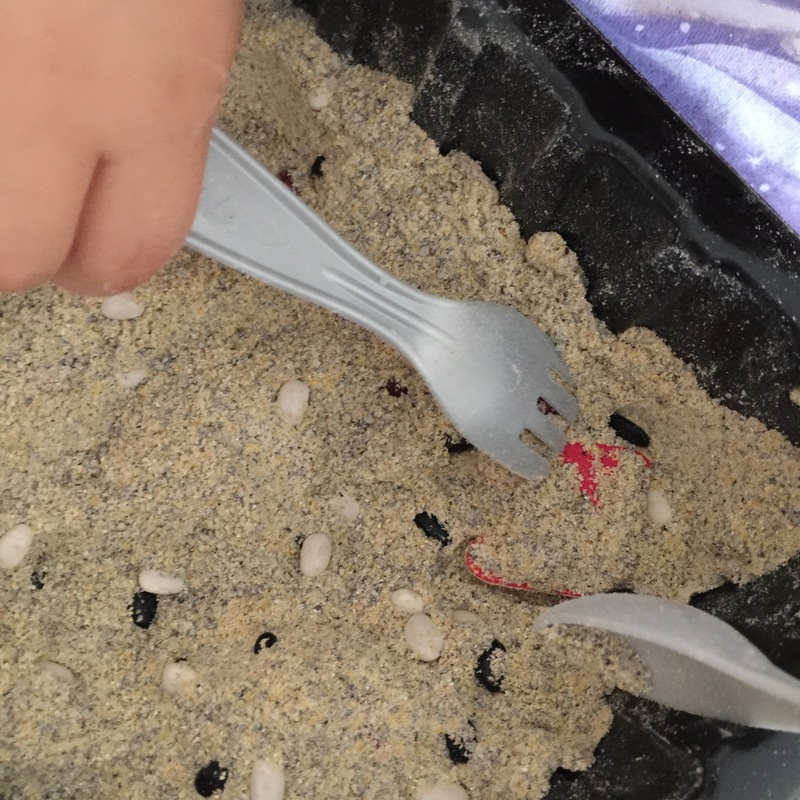 You can always top up your sand later with more materials. 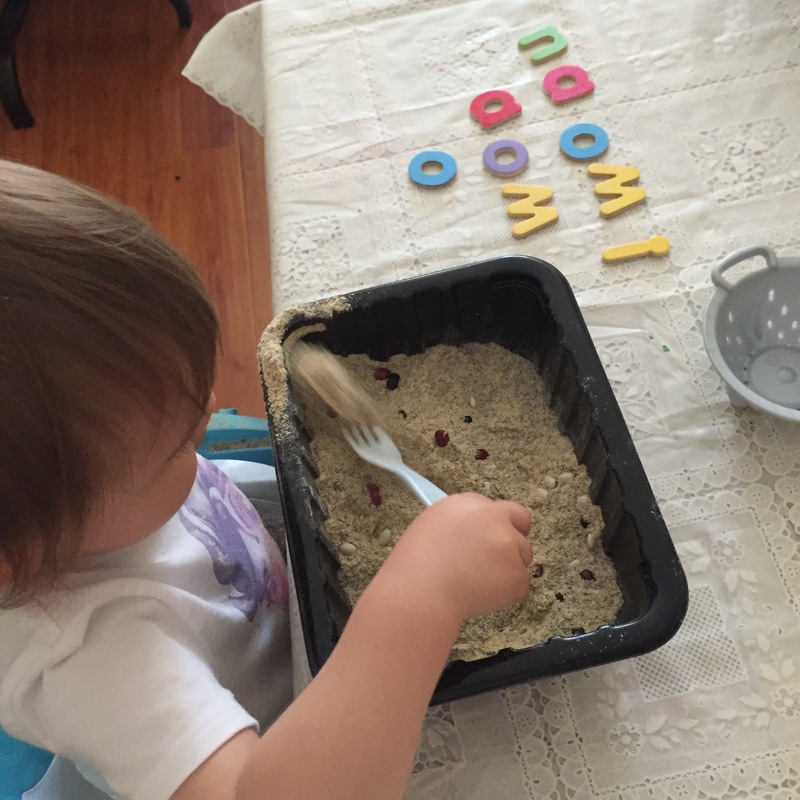 Before moving out to the States, the kids attended a wonderful playschool in Australia. The teachers there were amazing. Although they were mostly under the age of 25 (eek gads I’m old), they were loving, attentive, smart, and beautiful. It was quite obvious that they truly cared for the kids and wanted them to not only enjoy themselves, but learn! 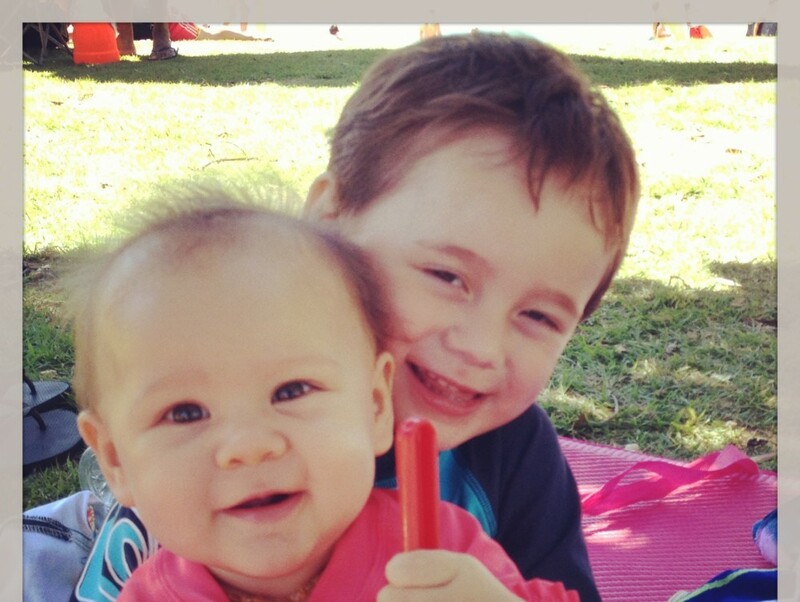 So as SAHM I’m trying to make sure our kids don’t lose any of the wonderful benefits they gained from daycare. 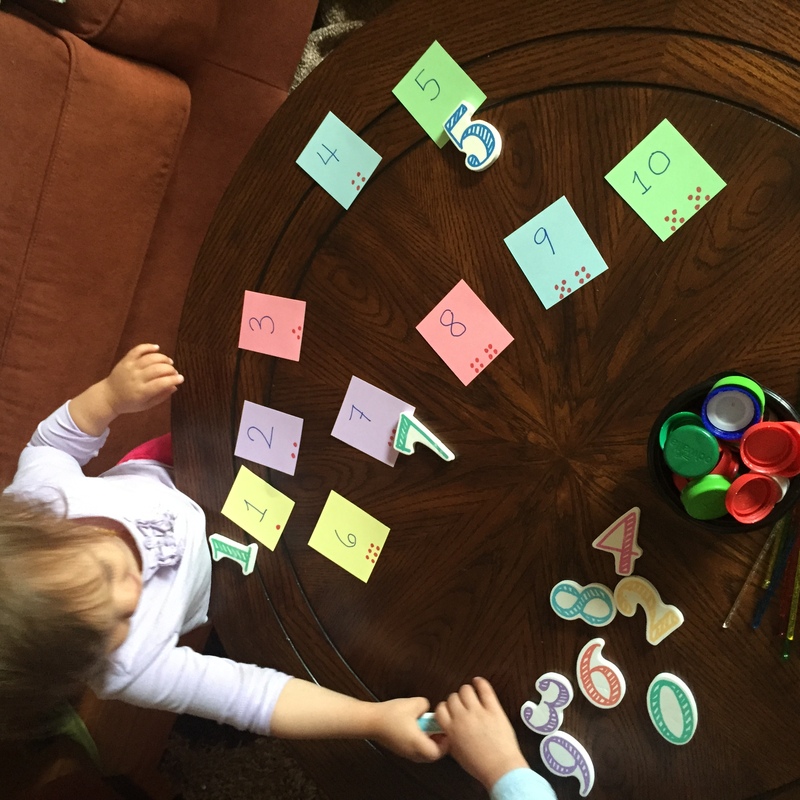 Today, while N was still napping, J and I looked into numbers! 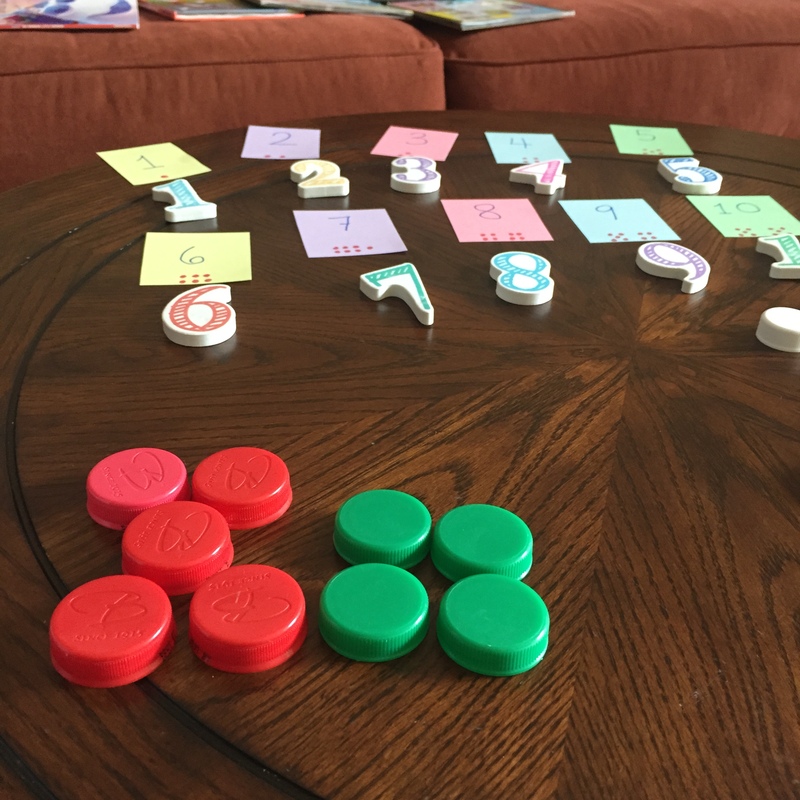 I made up colorful flashcards from 0 – 10. 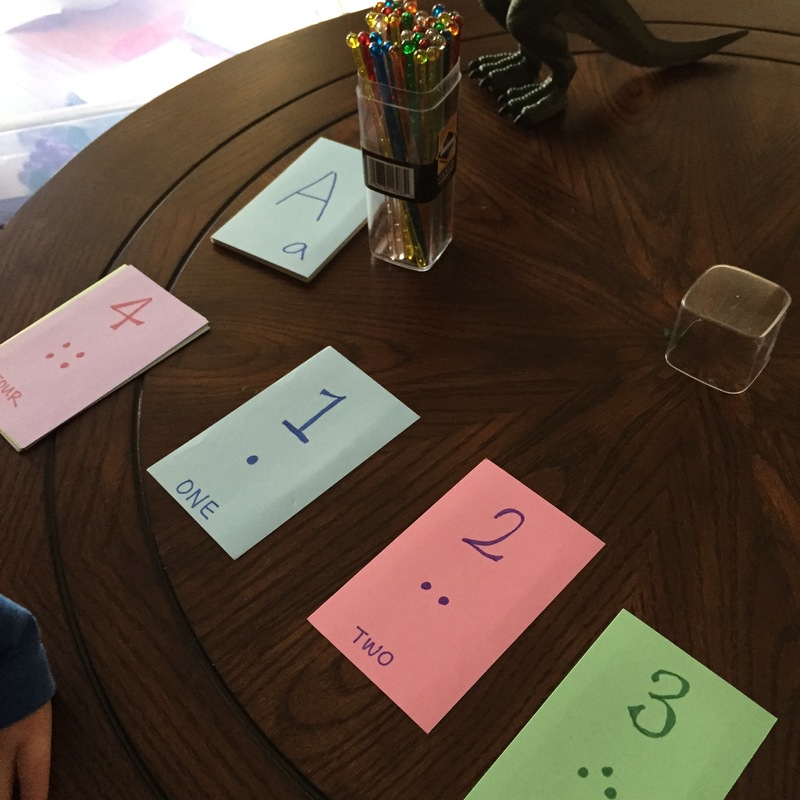 Each card had the number written with correlating amount of dots and the number spelled out. 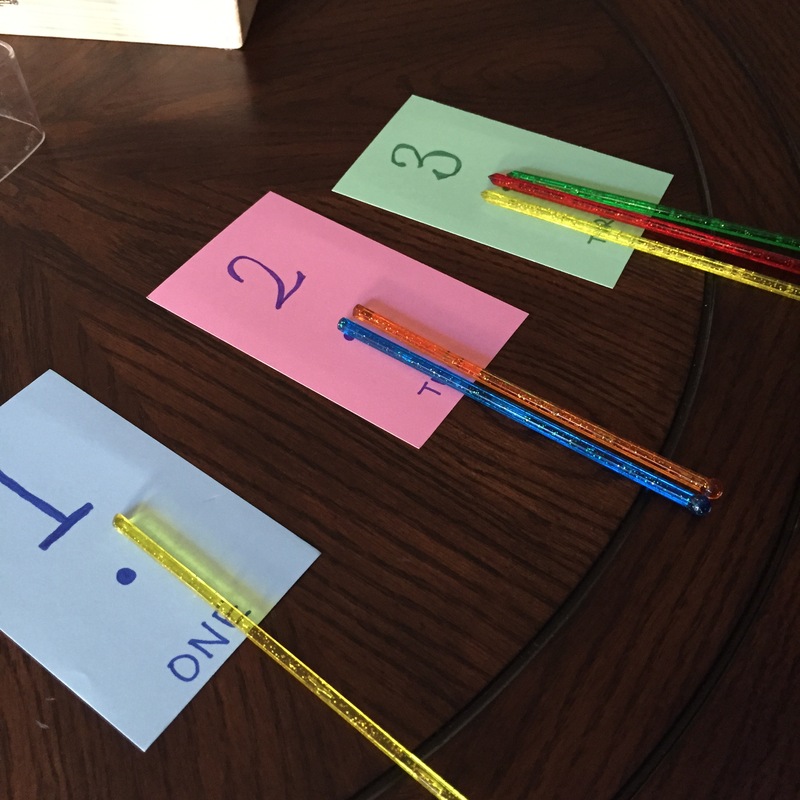 Then I had a stack of colorful cocktail stirrers for J to count with. 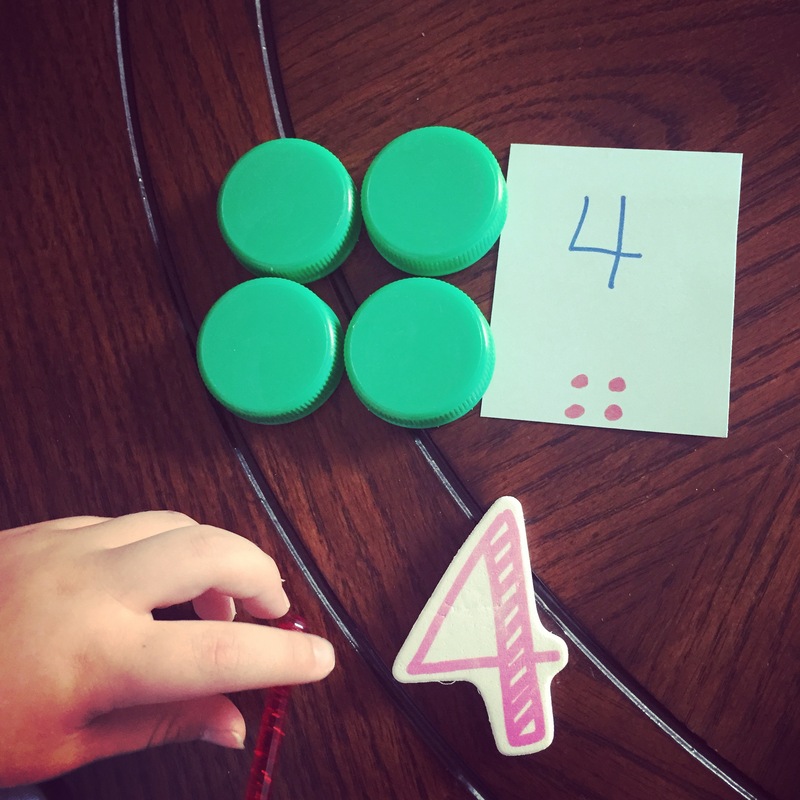 I had J trace each number and count each dot with a stir stick. 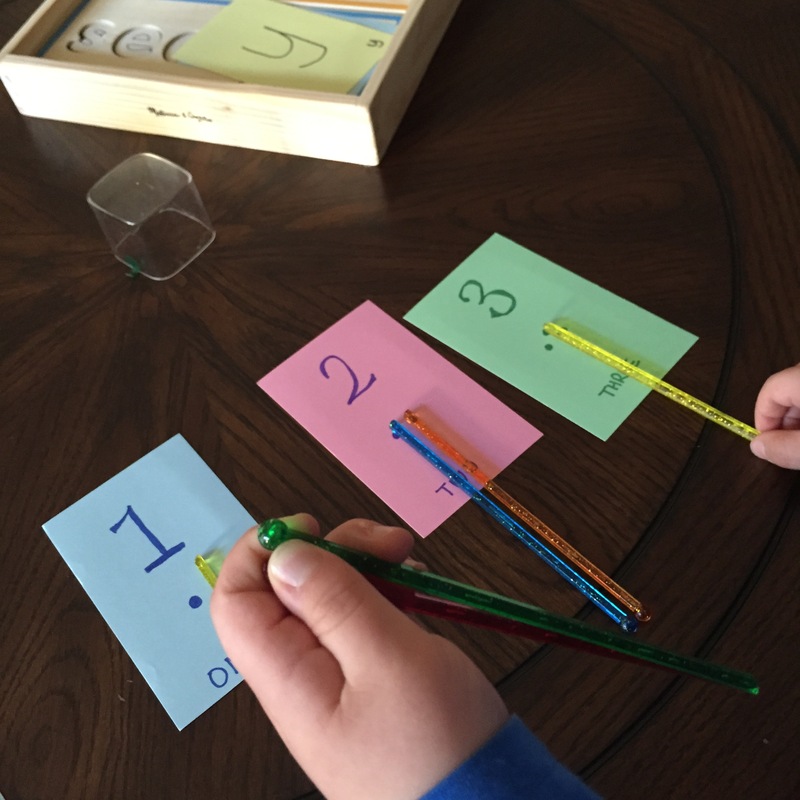 Then I had J count the number of sticks with each card. 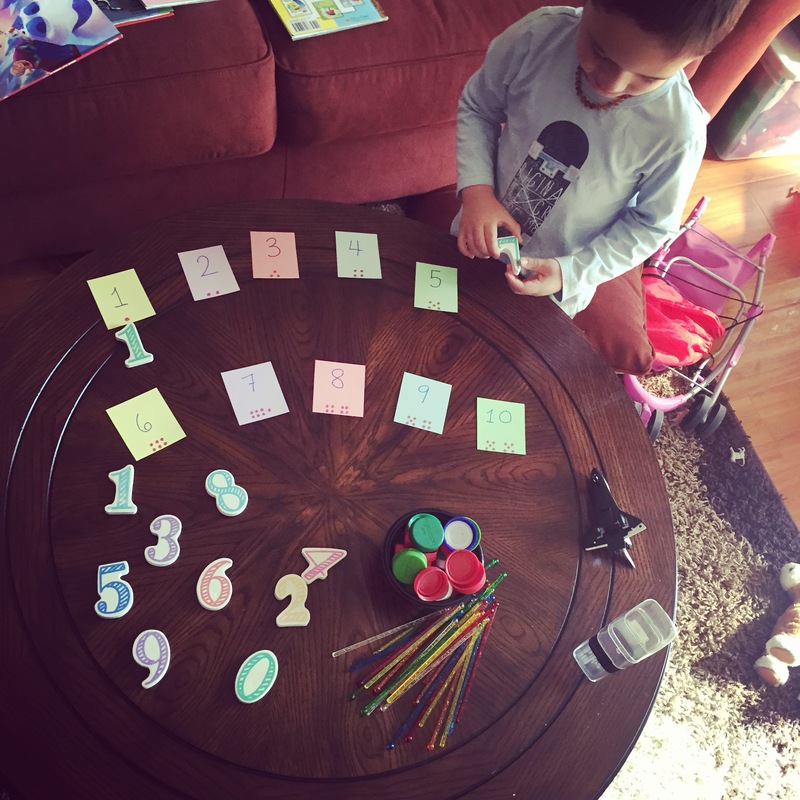 THEN something awesome happened….J came up with his own game with the numbers and sticks. 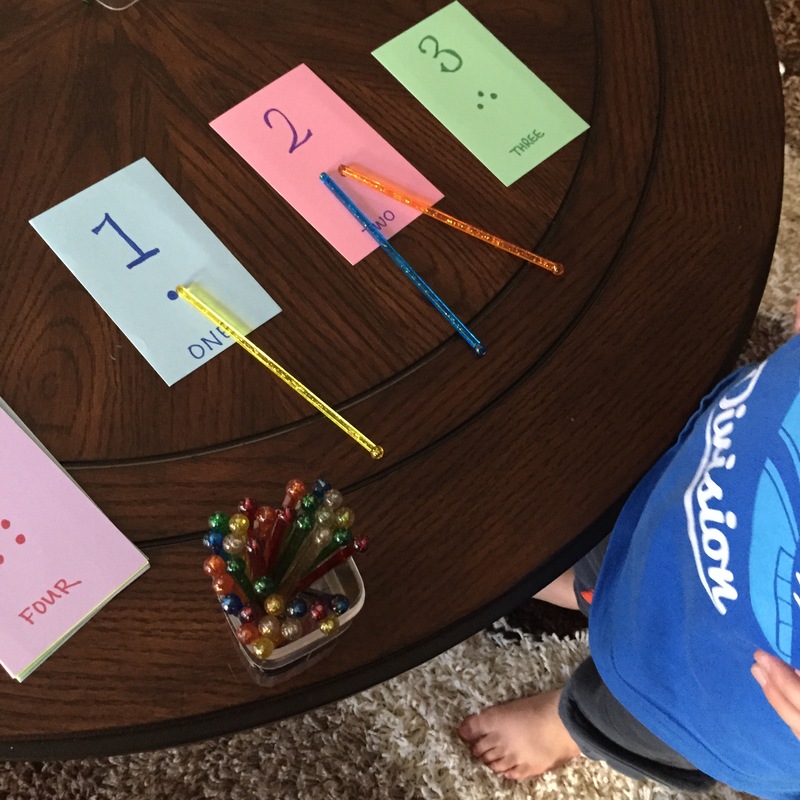 He lined each stick up with each dot on the index cards! Morning at Super Franks on a Stormy Day!